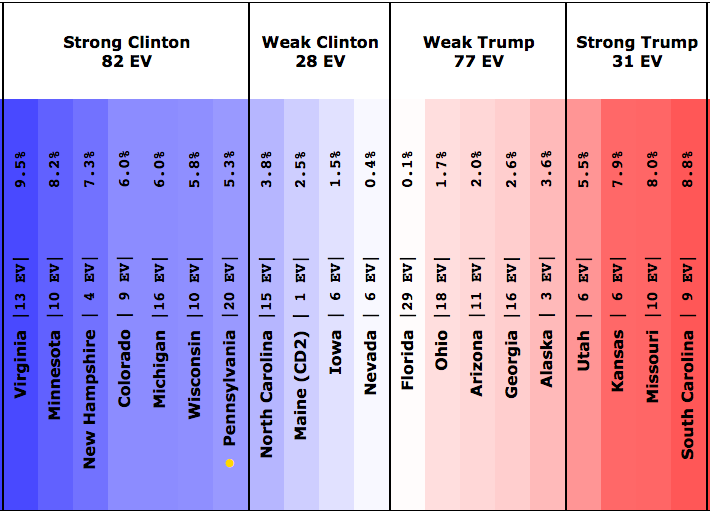 States with new poll data added since the last update: All 50 states, plus the Maine congressional districts. 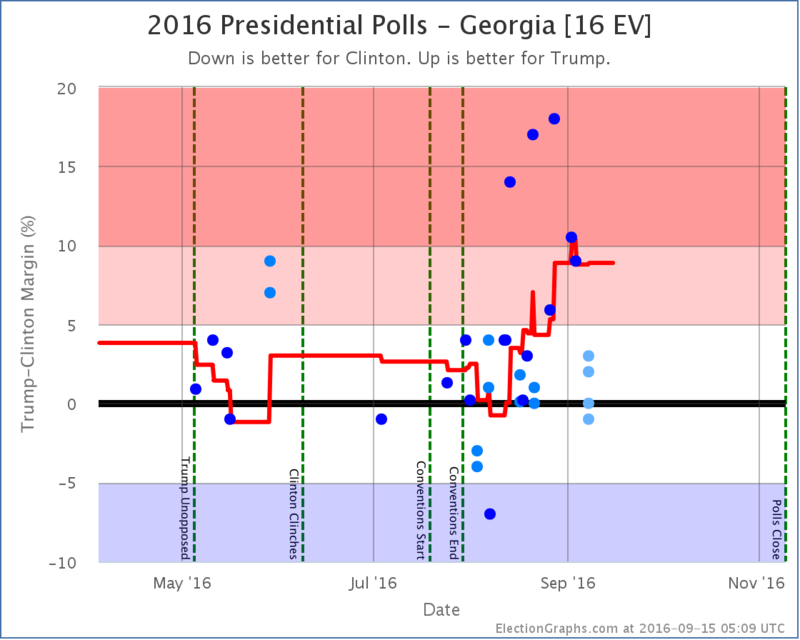 Notable changes caused by Colorado, Florida, Missouri, New Hampshire, Maine (CD2), and South Carolina. 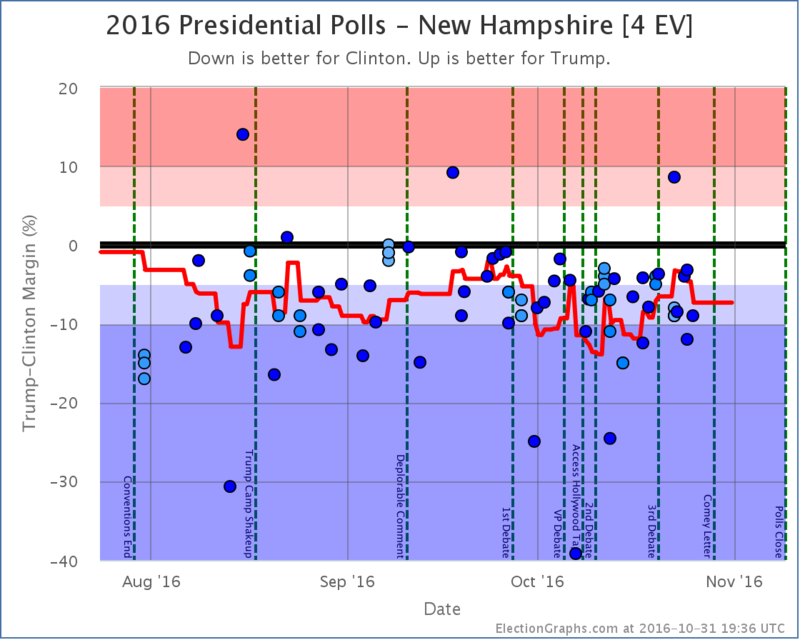 There were a ton of changes with this batch of new polls. 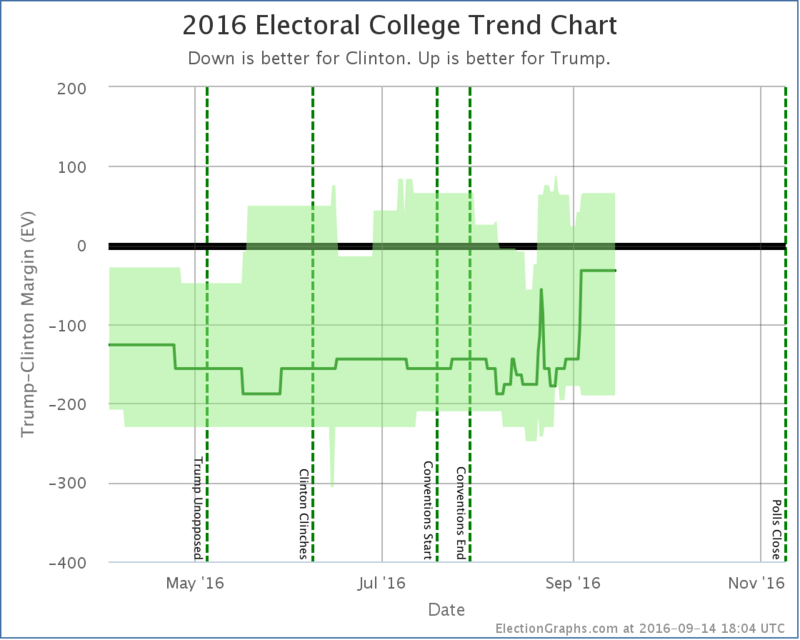 Four of the changes favored Trump, two favored Clinton. 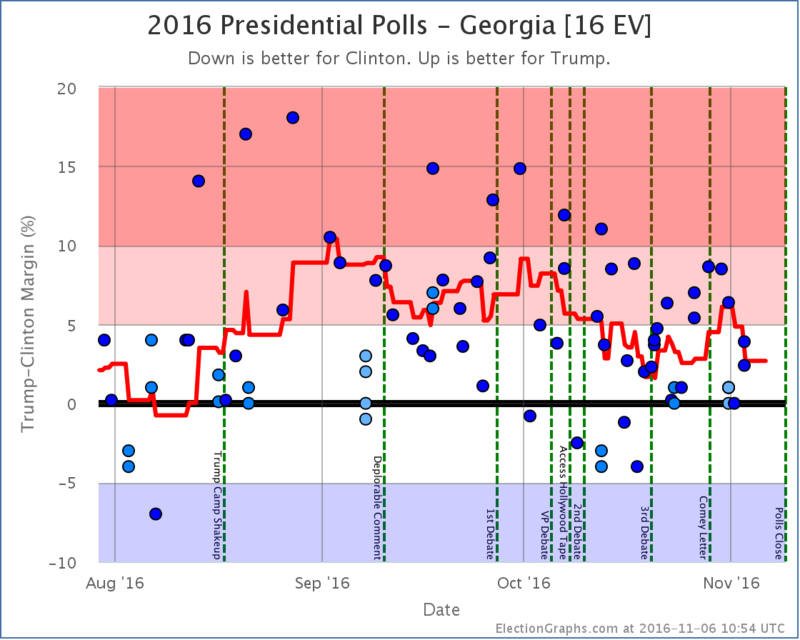 We’ll look at each of these in order. 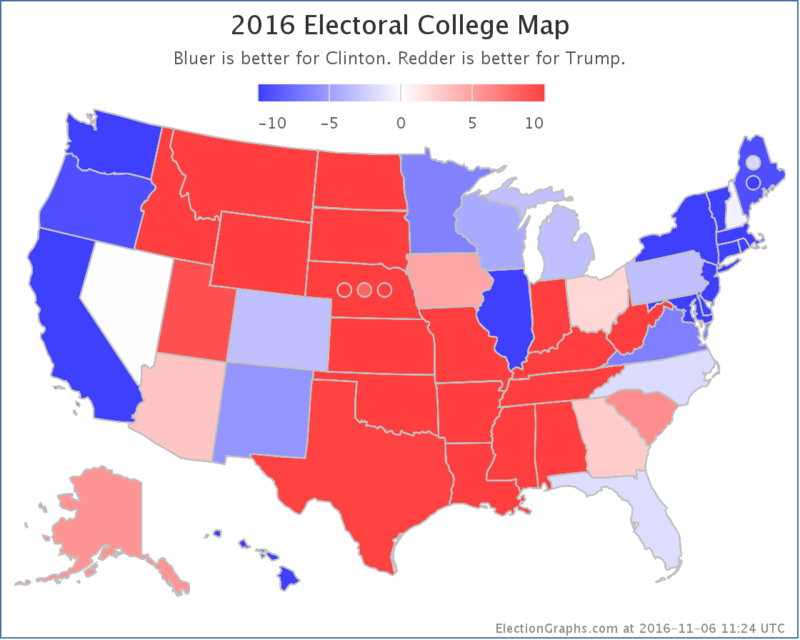 The “good for Trump” states first, then the “good for Clinton” states, then we’ll review the net national changes due to all of these together. 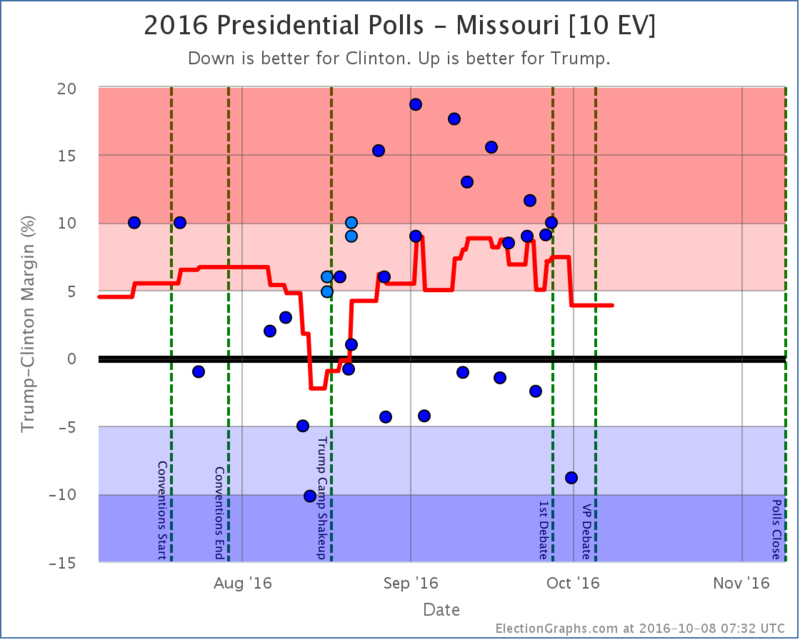 Missouri and South Carolina had looked like states where Clinton was making it close, Trump now pulls them out of reach again. 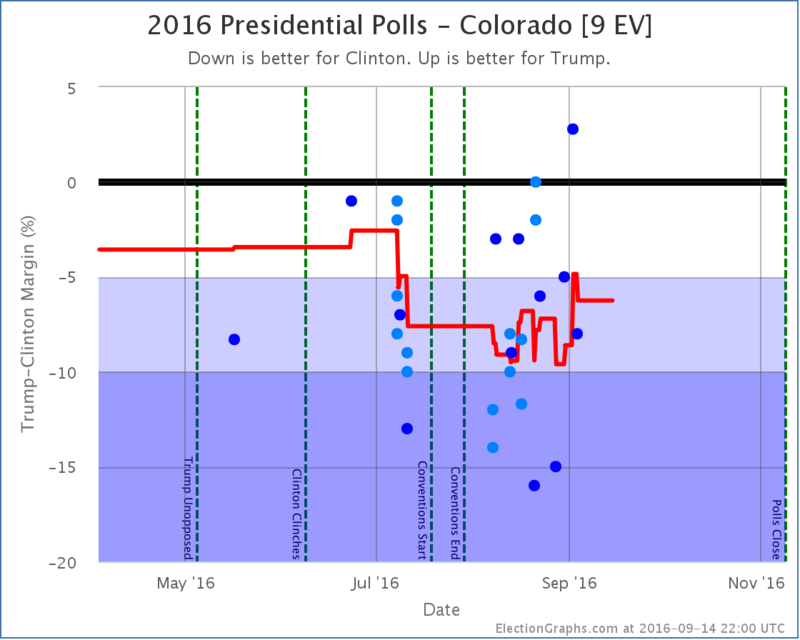 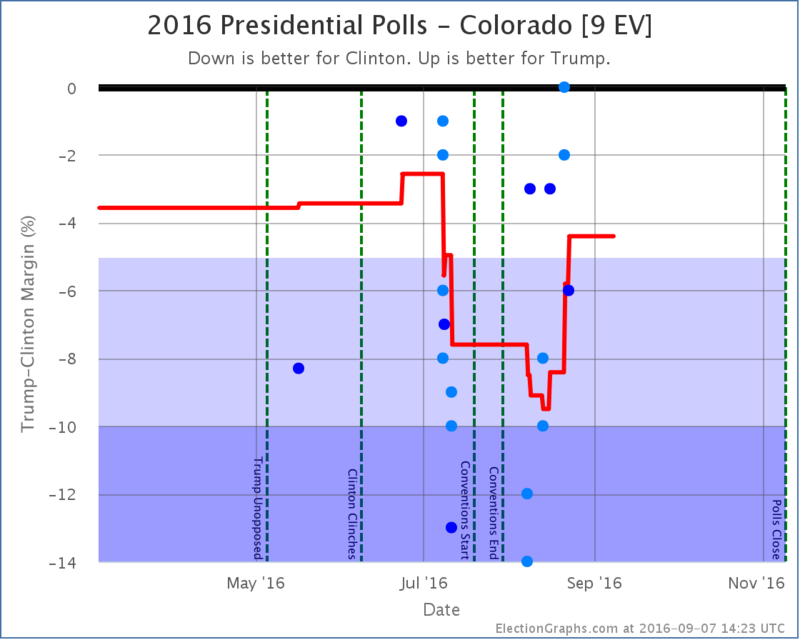 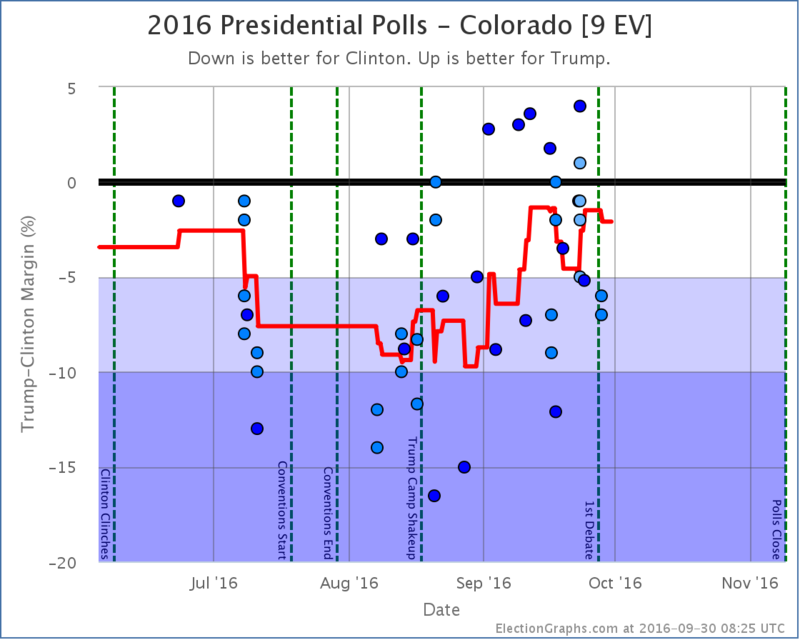 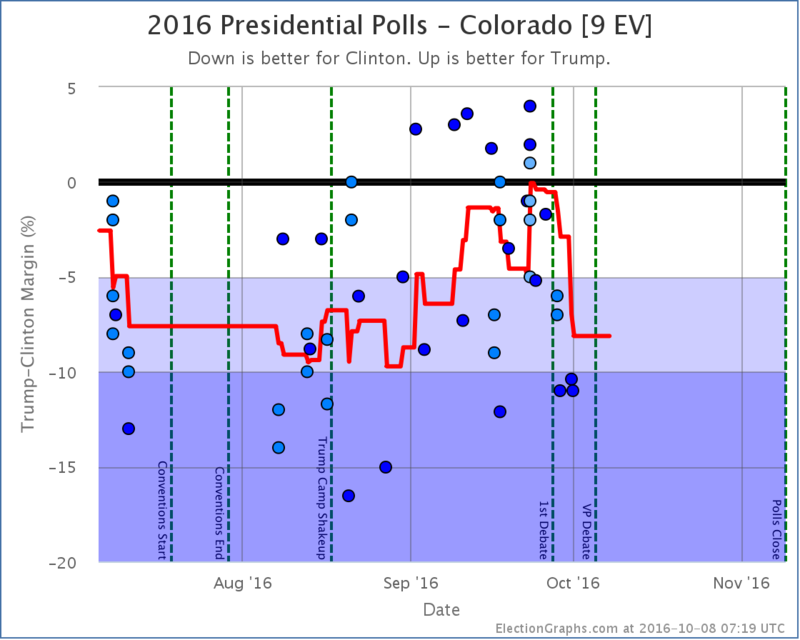 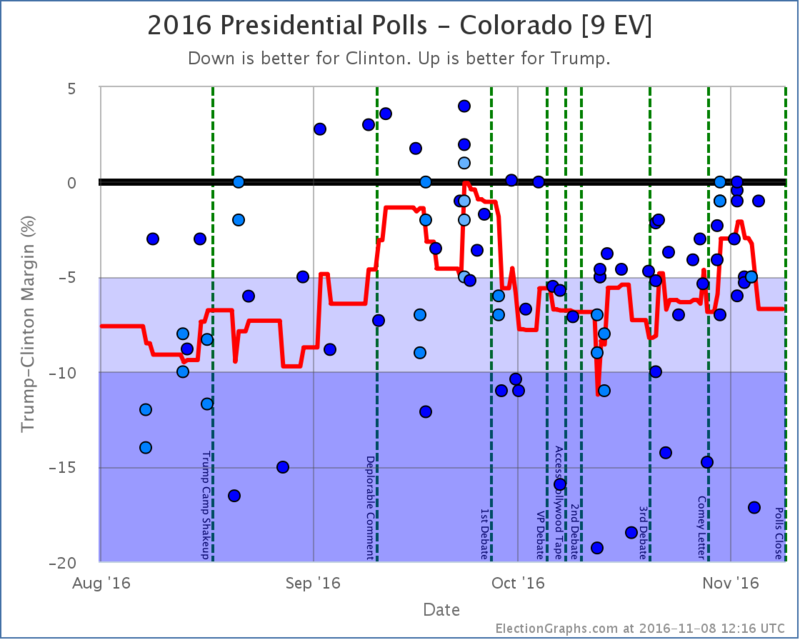 Meanwhile Clinton’s lead in Colorado looked like it was not at risk for her, but the last few polls show Trump making it close again. 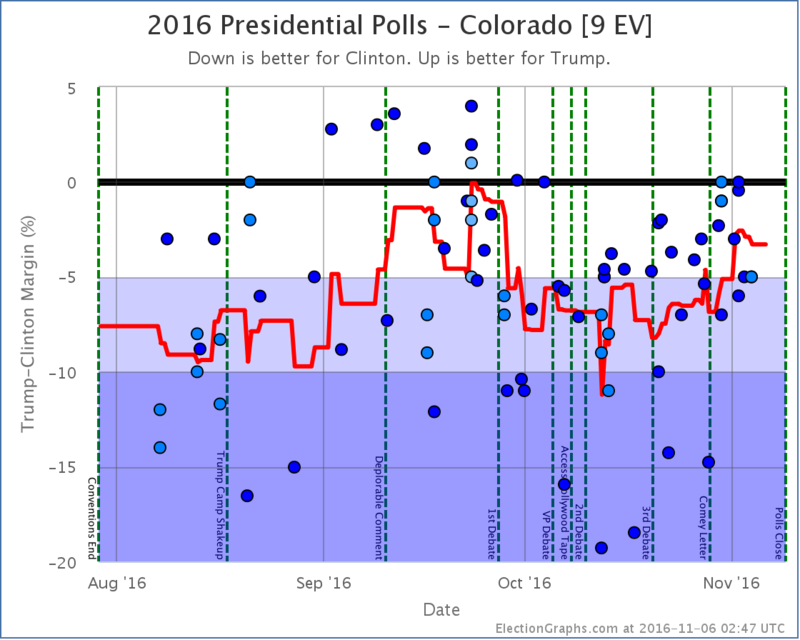 So winning Missouri and South Carolina are no longer part of Clinton’s best case, while the possibility of winning Colorado is now included in Trump’s best case. 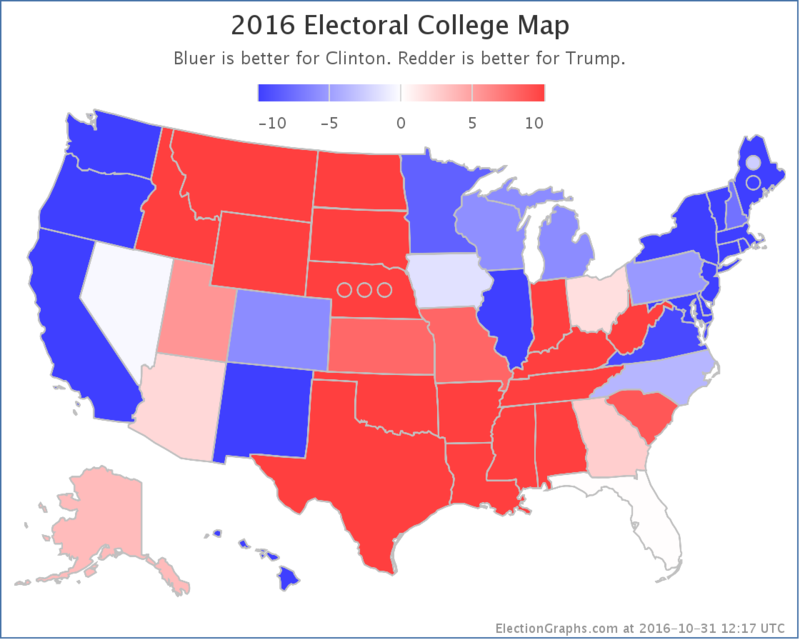 Maine and Nebraska are the only two states that can split their electoral votes. 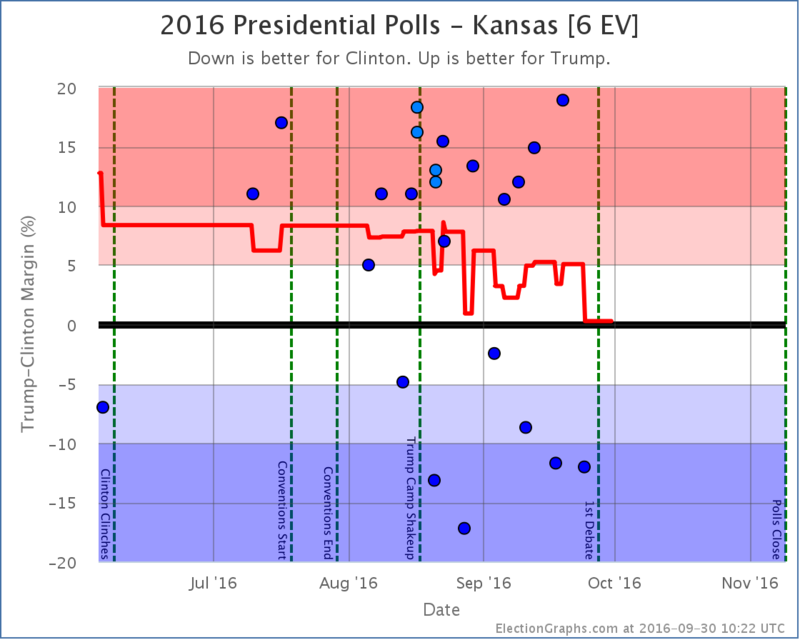 So far Nebraska has not been polled at all at the congressional district level. 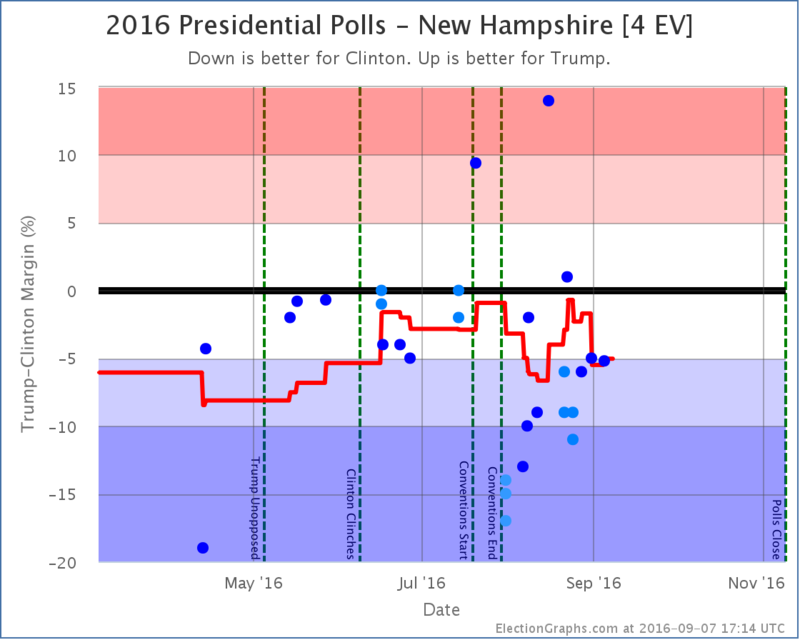 This week brings only the second time the Maine congressional districts have been. 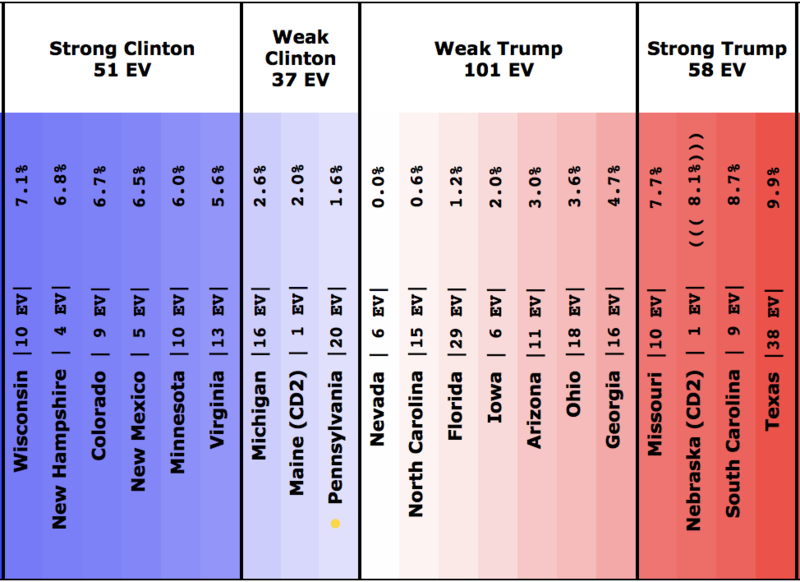 In both cases, the overall numbers for the states have moved toward the center line past all of the congressional districts. 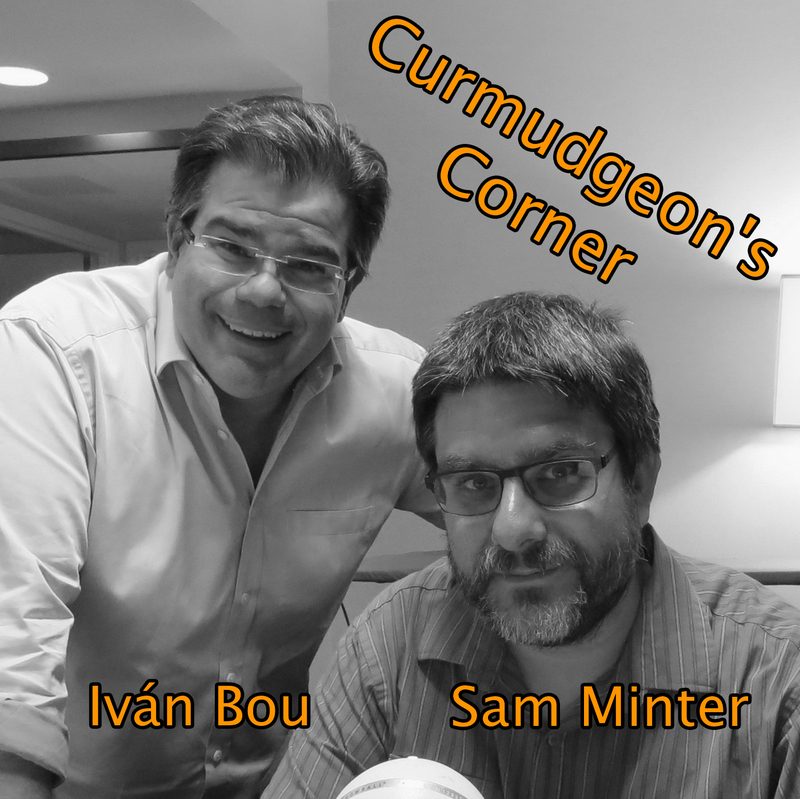 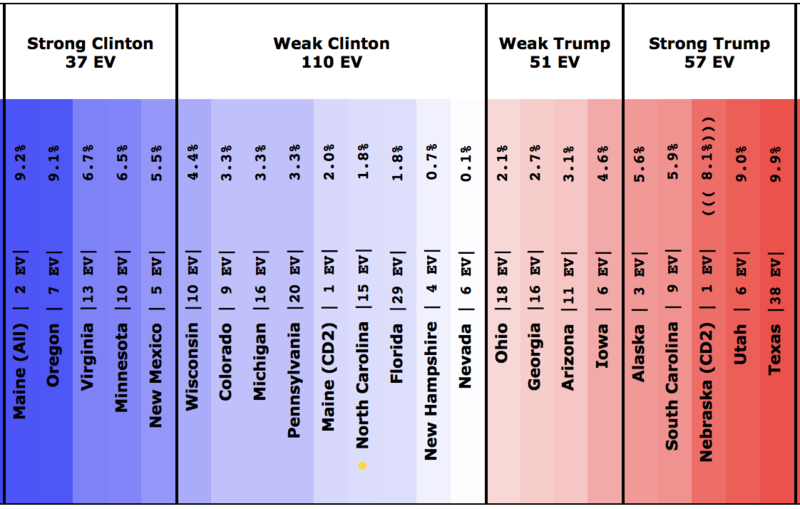 Mathematically, the state as a whole can’t be closer than all the parts making up the state, so we know this is wrong, but without congressional district polling, we can’t tell where the congressional districts should be. 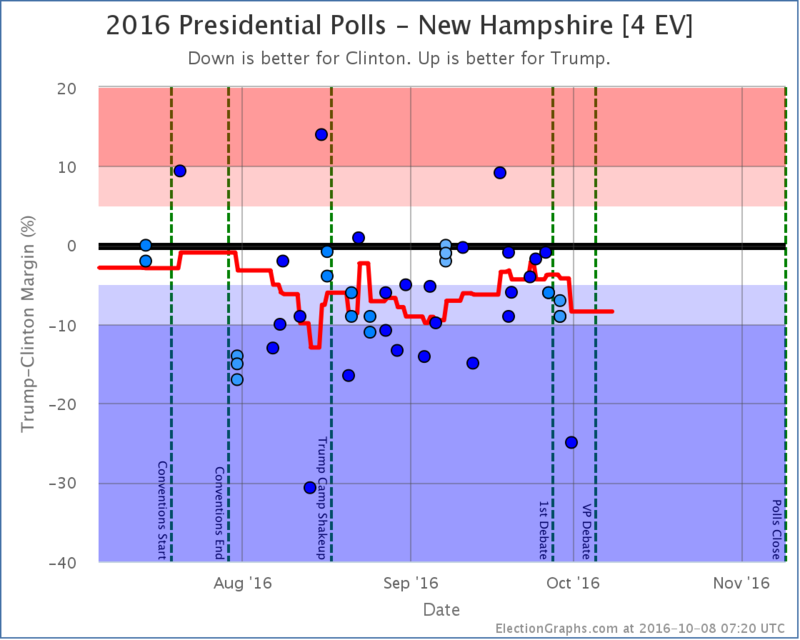 In Maine, with the new CD2 polling result, we now have two polls showing Trump ahead. 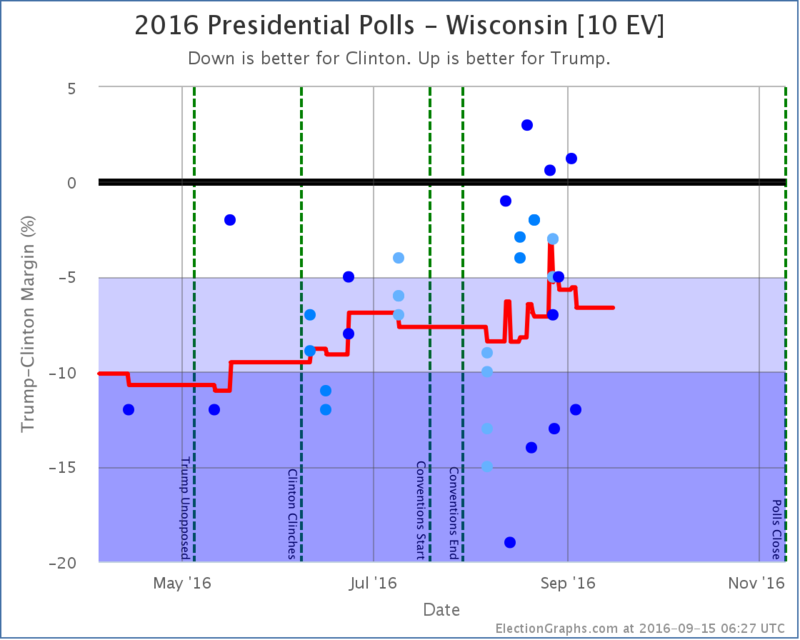 These are the only two polls. 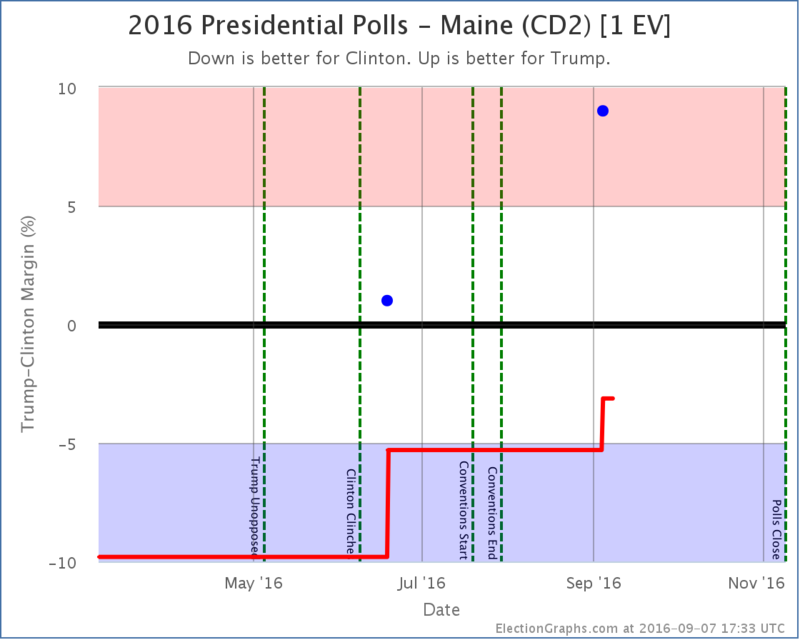 The average is filled out with the Maine CD2 results from 2004, 2008, and 2012. 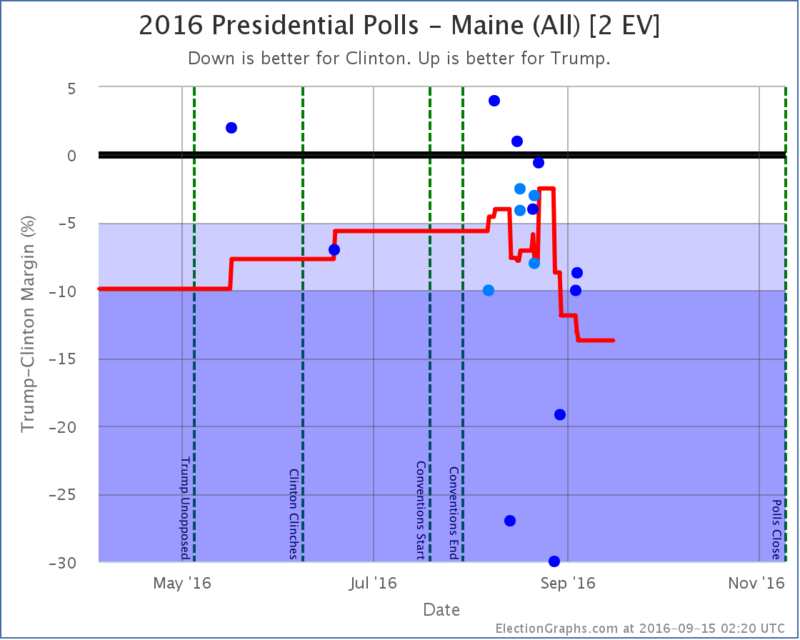 Given the strong Democratic wins in CD2 in those years, the two polls from this year aren’t quite enough for the poll average to flip the district to Trump, but the average now only has Clinton up by 3.1%, so we now consider Maine’s 2nd District to be a possible pick up for Trump. 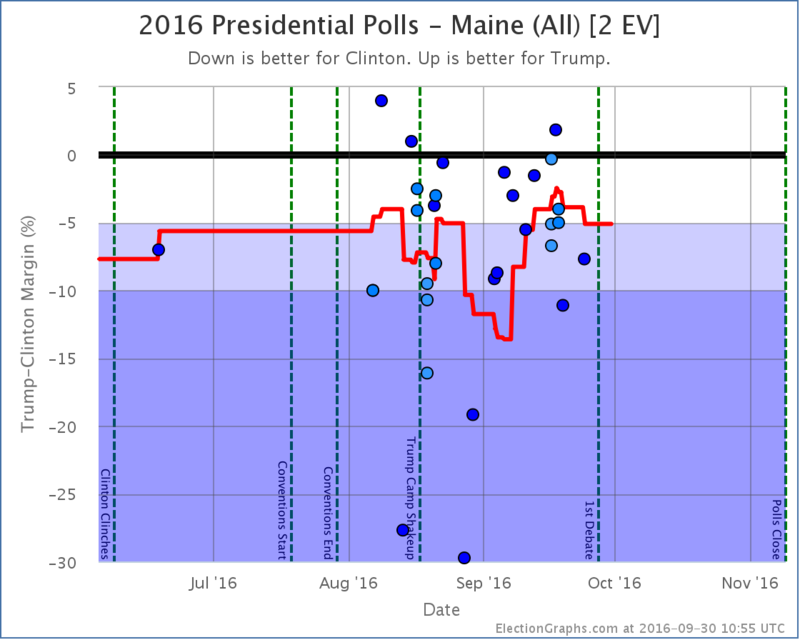 Even with this new poll, Maine-CD2 is what I consider to currently be the “most needed poll” (followed by NE-CD2, NE-CD1, SD, and ME-CD1). 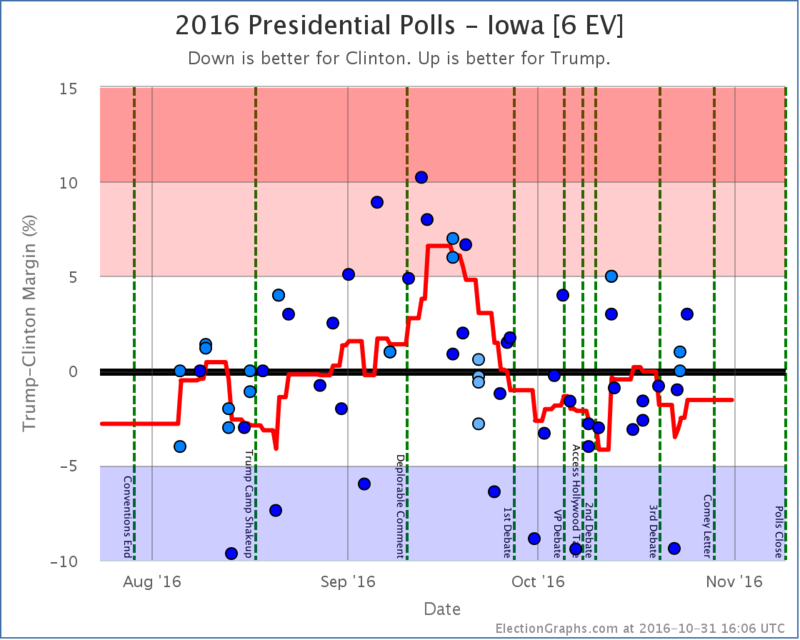 Please pollsters! 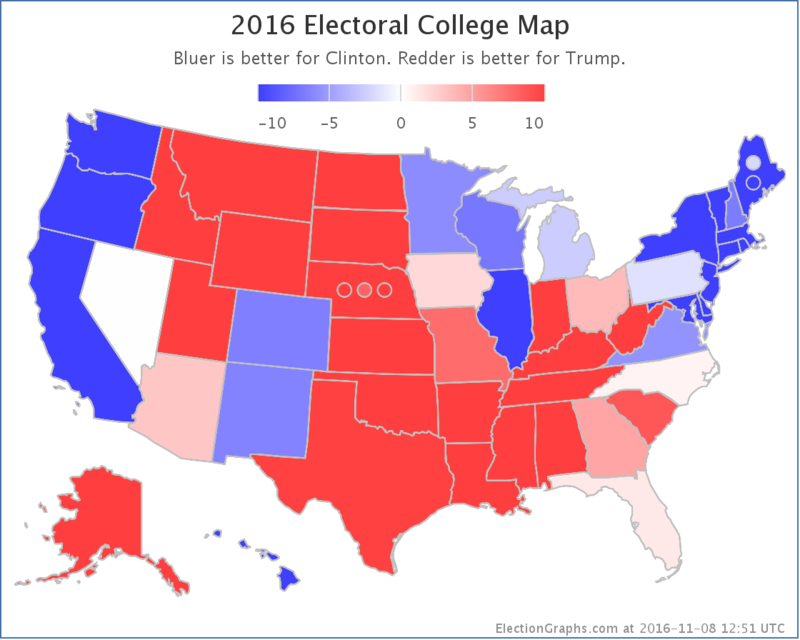 More congressional district level coverage of both Maine and Nebraska! 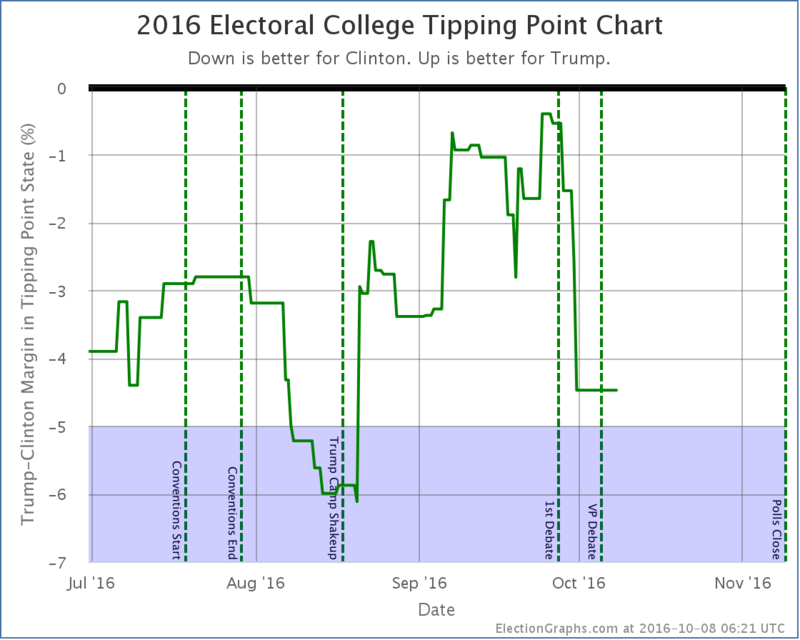 They both look like they have a possibility of splitting this cycle. 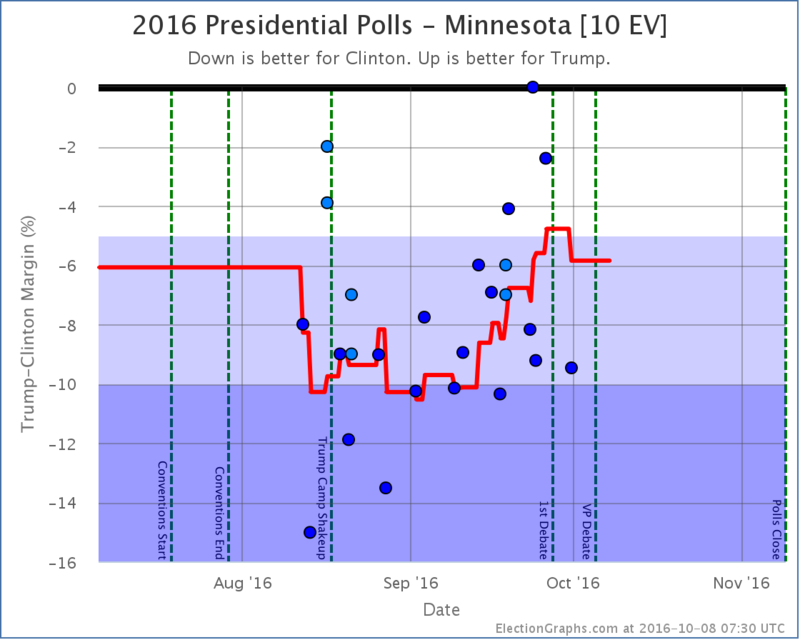 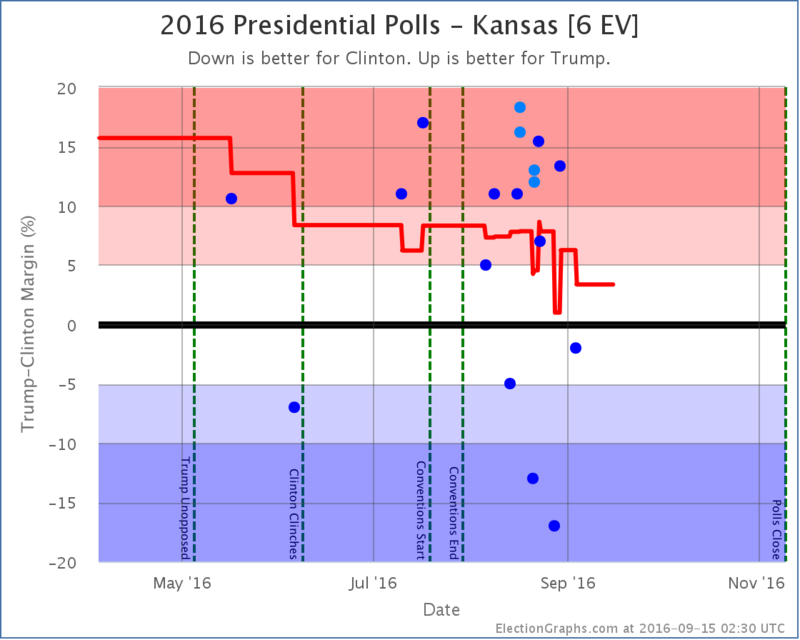 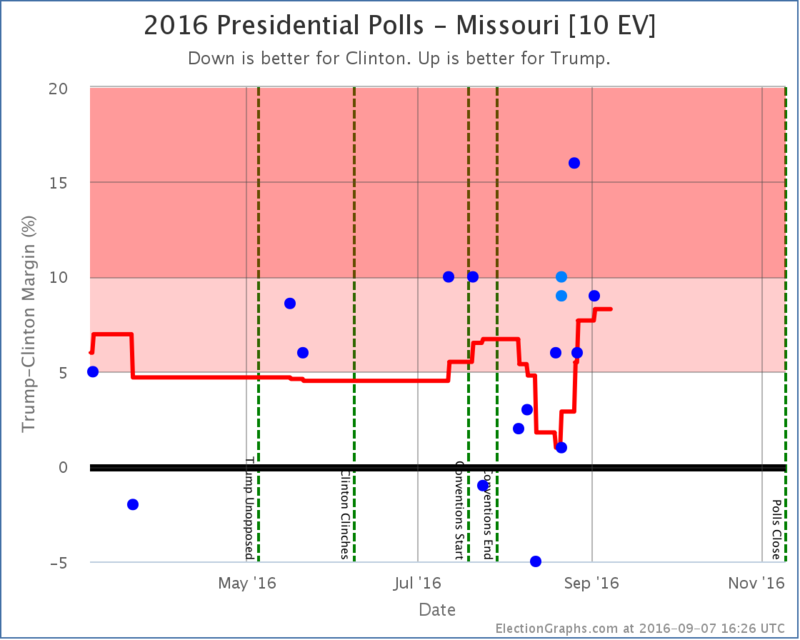 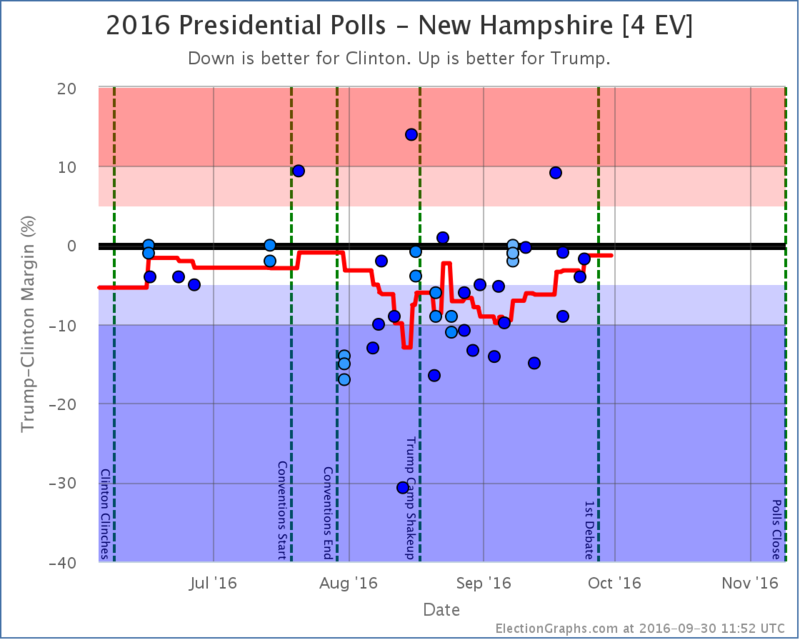 We need more polling to understand just how likely (or not) that possibility actually is! 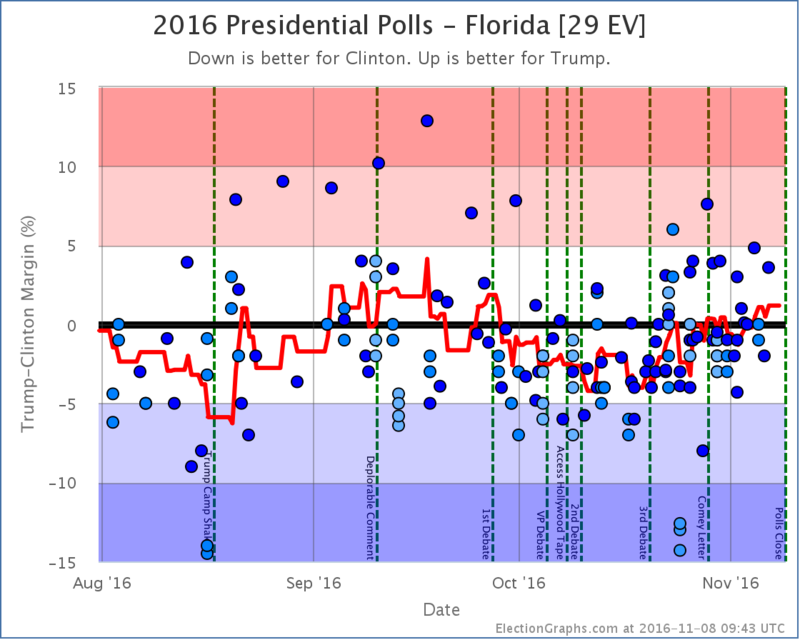 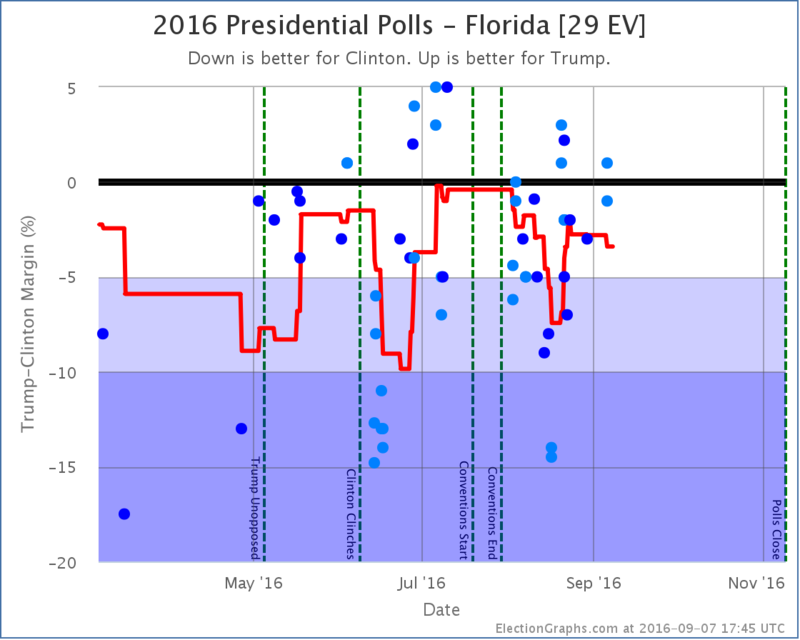 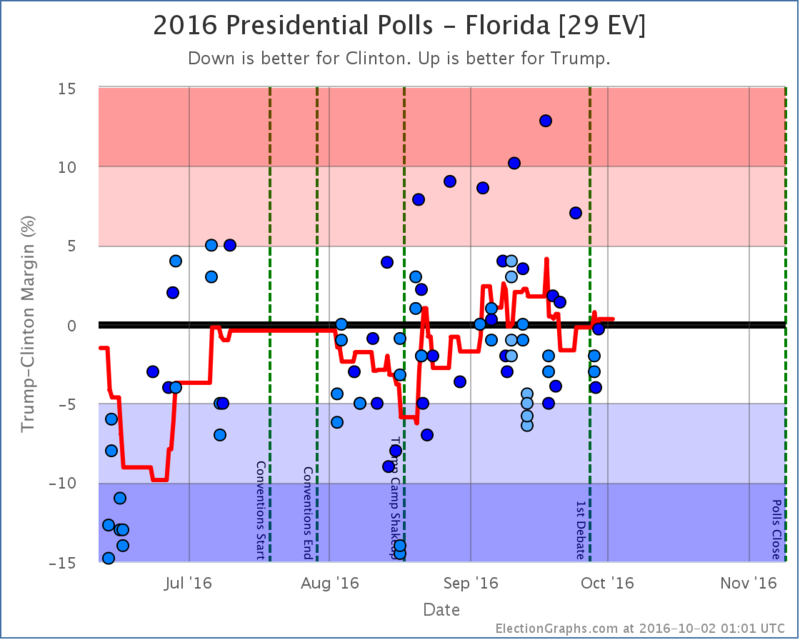 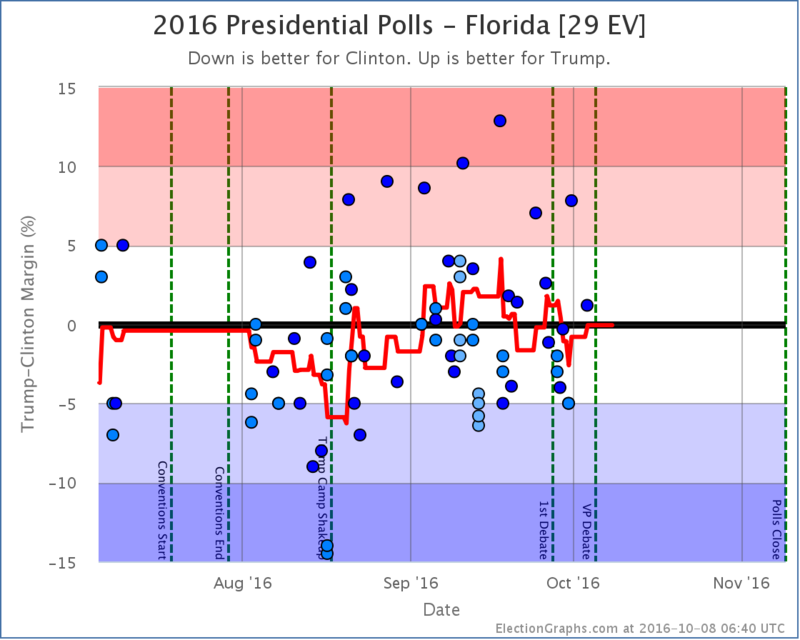 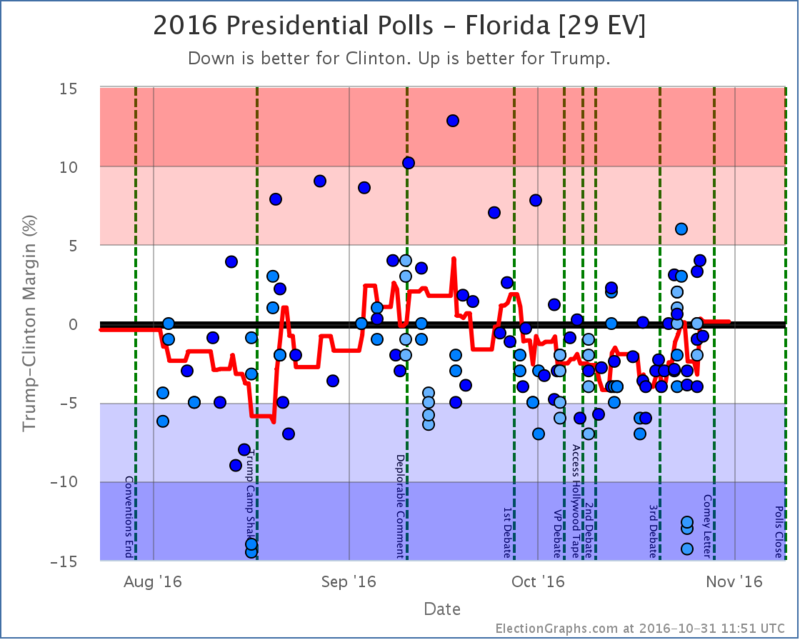 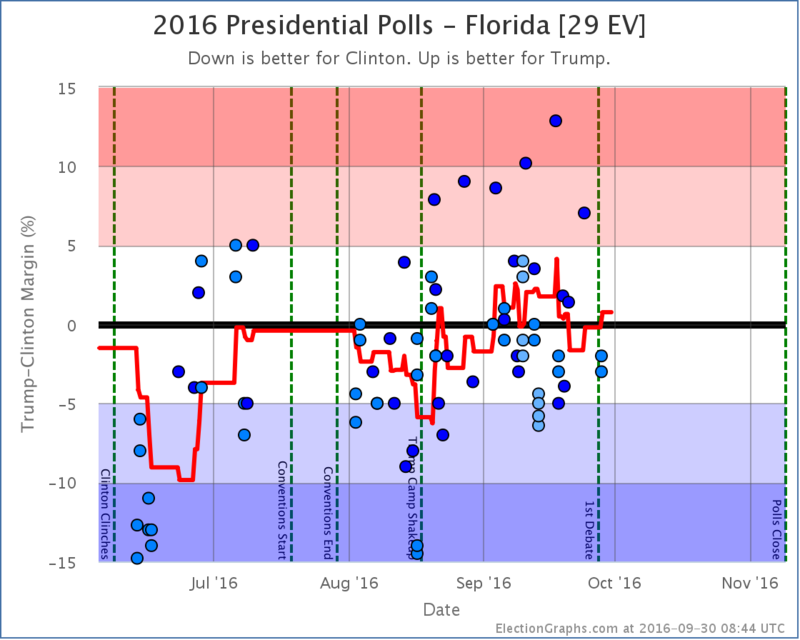 Both Florida and New Hampshire show the typical pattern of the Trump collapse followed by a Trump recovery. 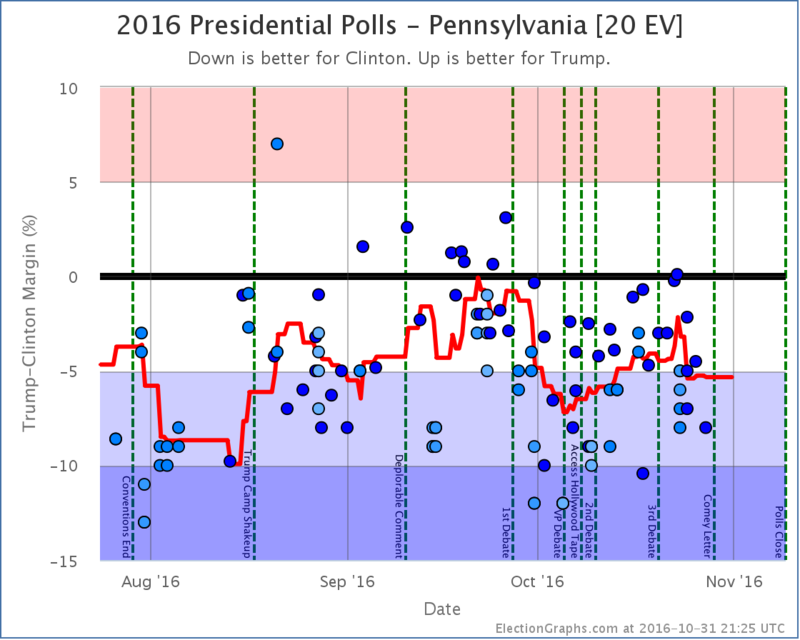 But in these two states, Trump peaked and is starting to drop again. 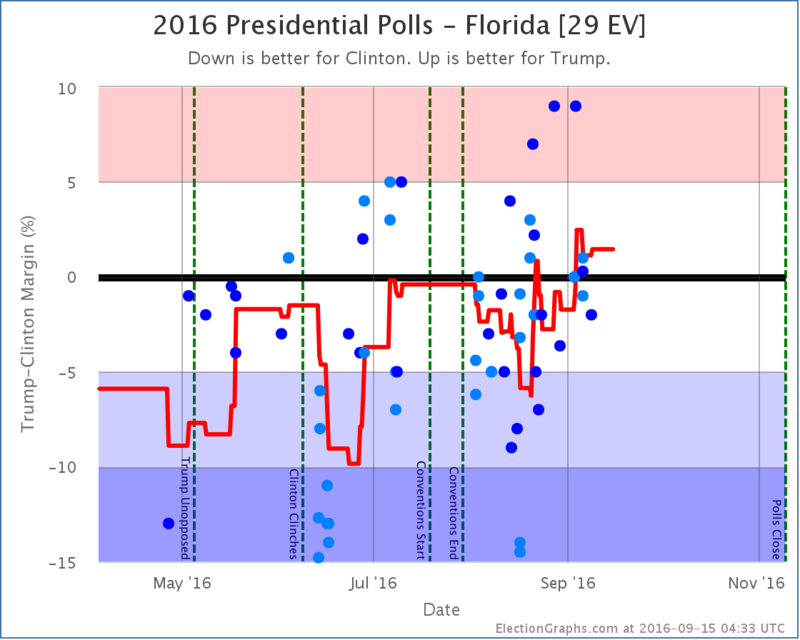 Florida does not change categories, but the change there changes the national tipping point. 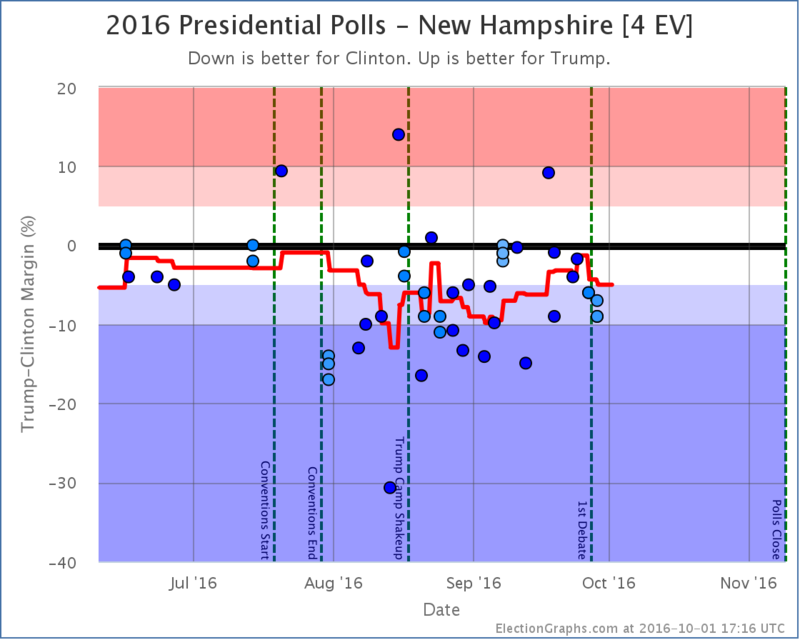 In New Hampshire, the average just barely passes our 5% threshold to put the state back in the “Strong Clinton” category, which removes New Hampshire from Trump’s best case. 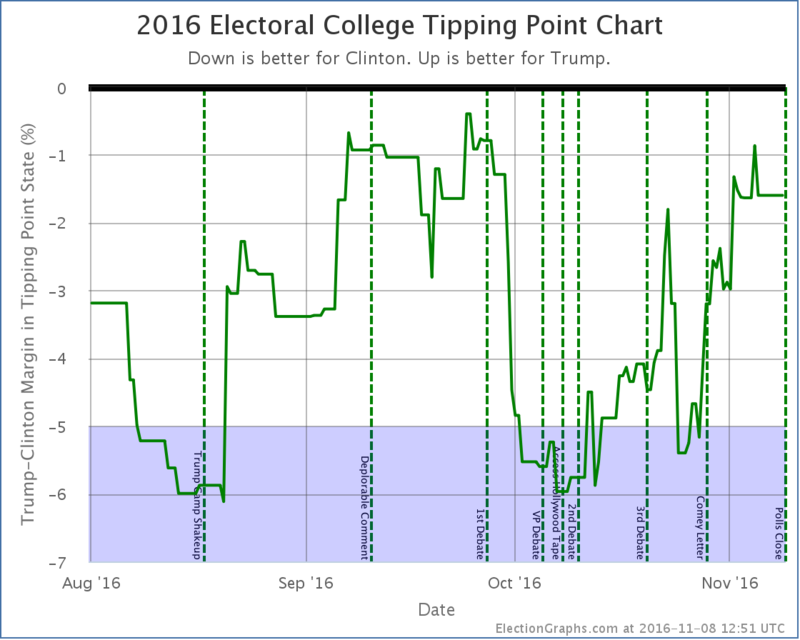 It is right on the line though. 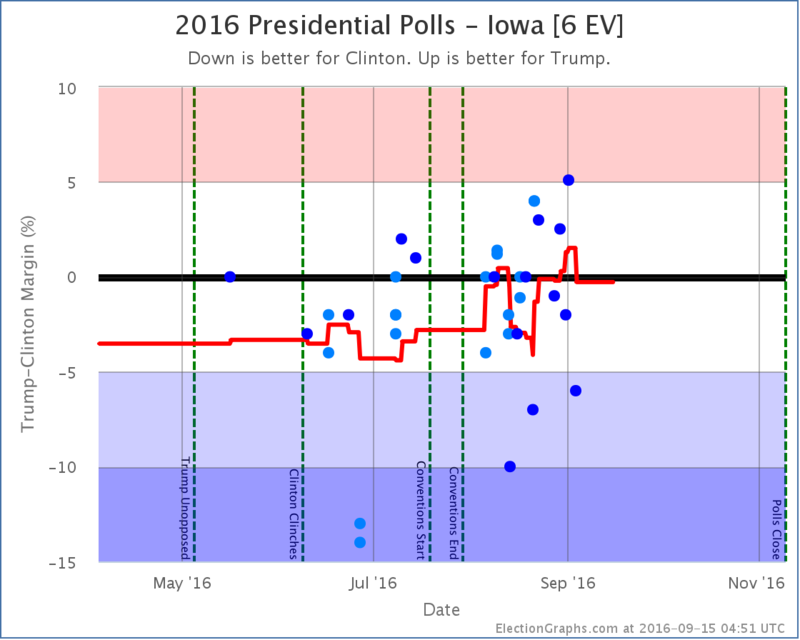 Clinton’s lead still rounds to 5.0%. 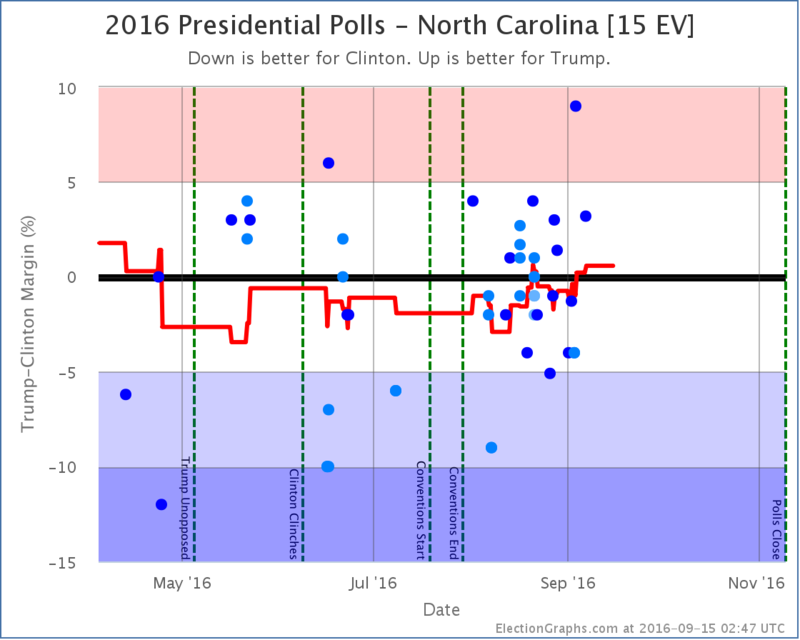 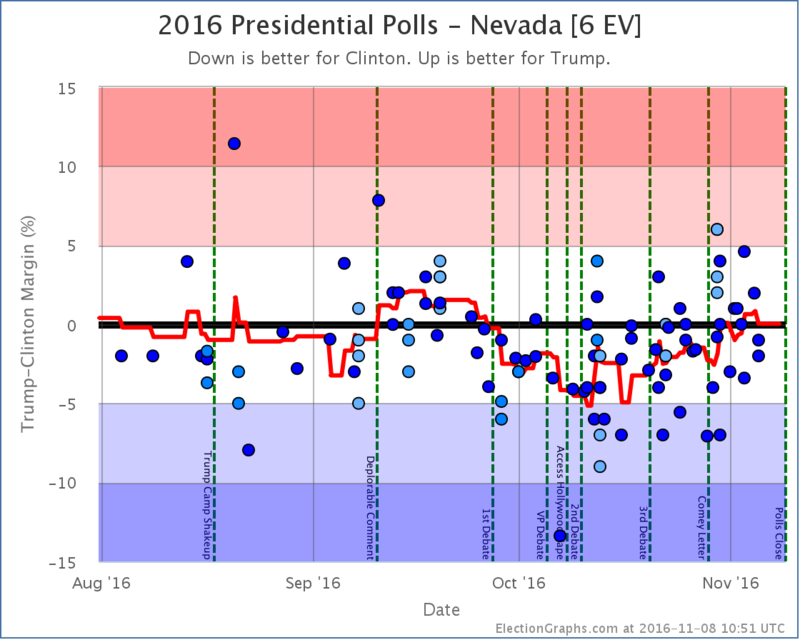 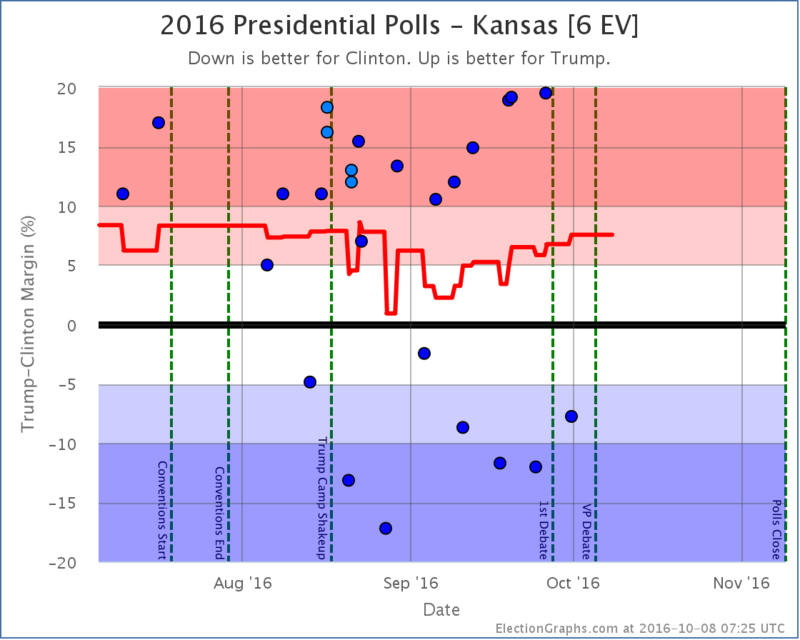 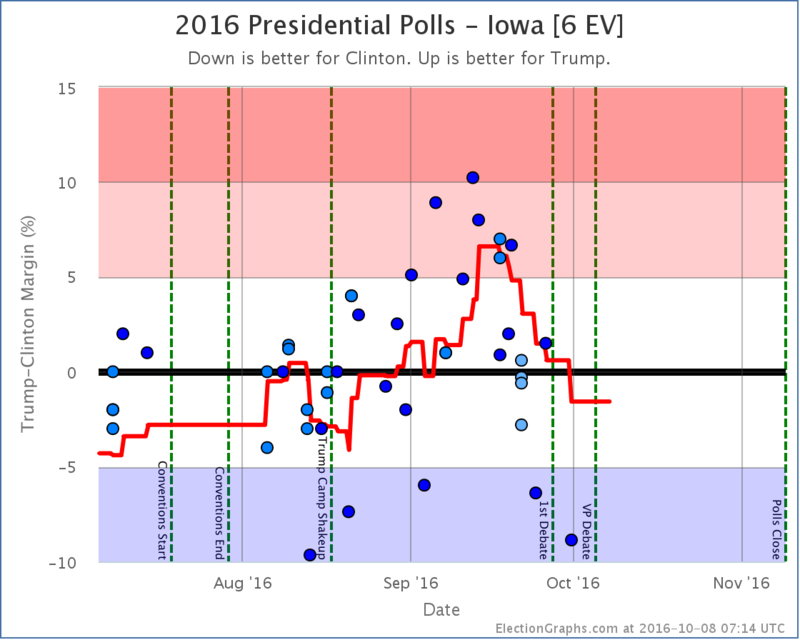 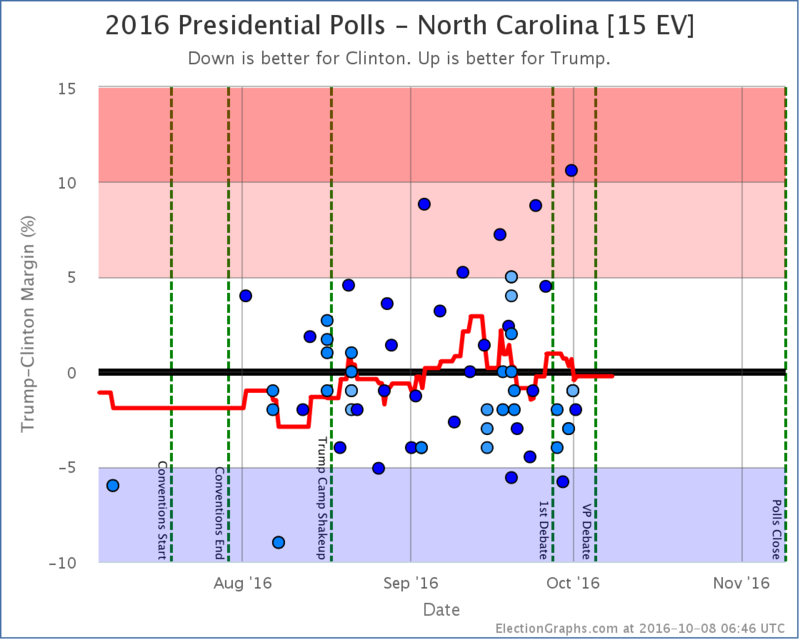 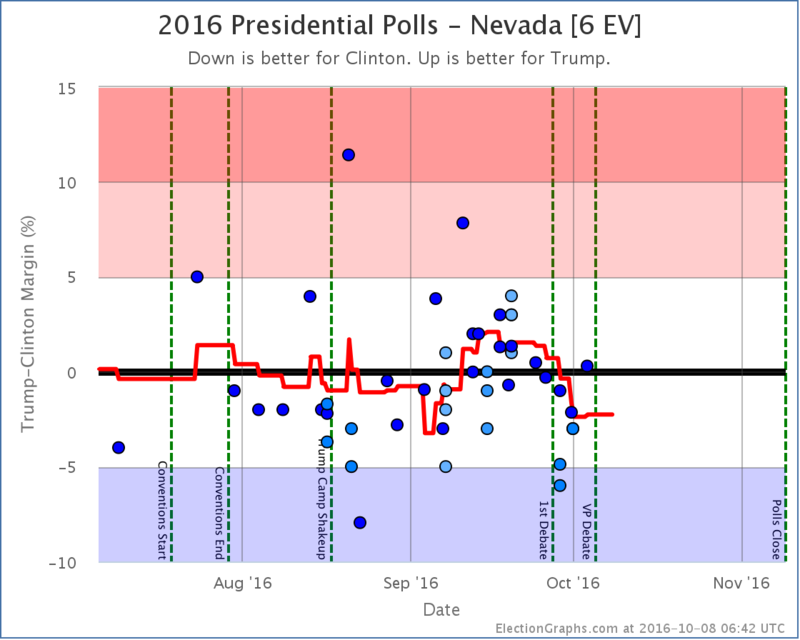 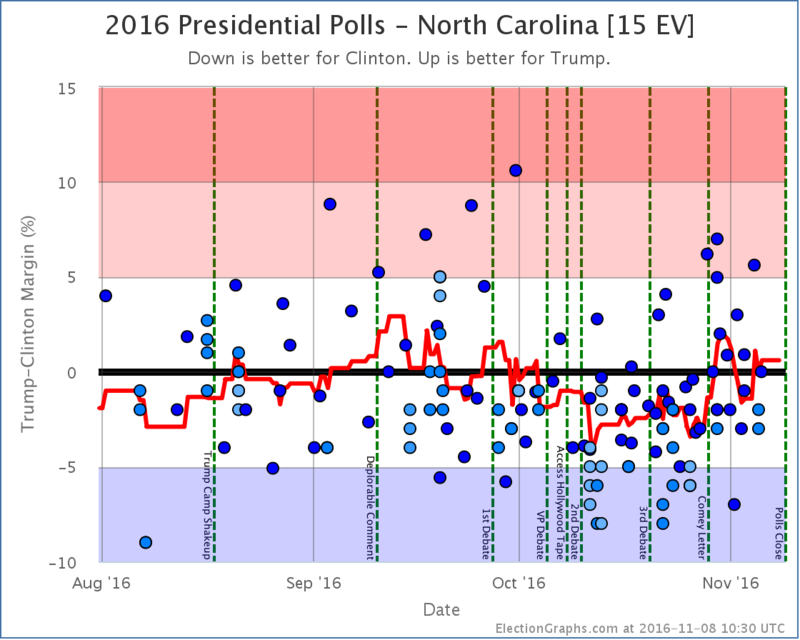 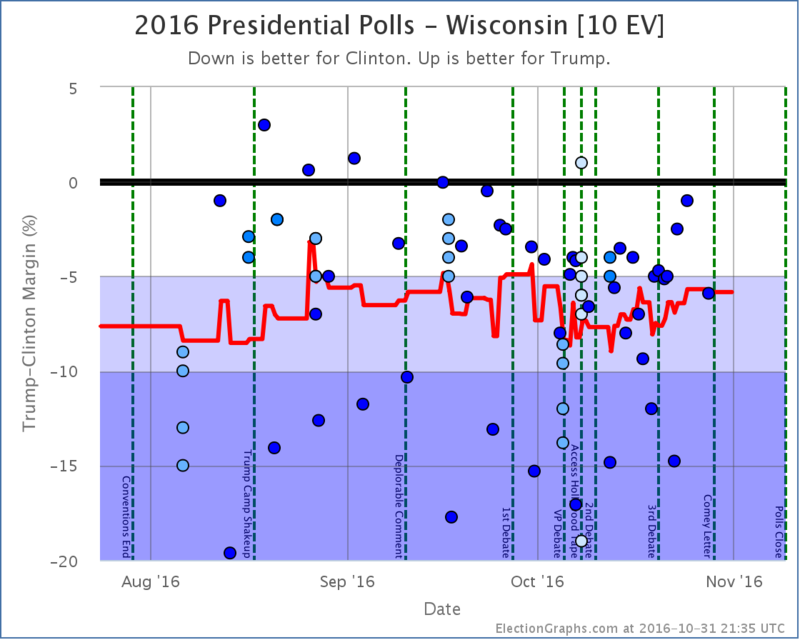 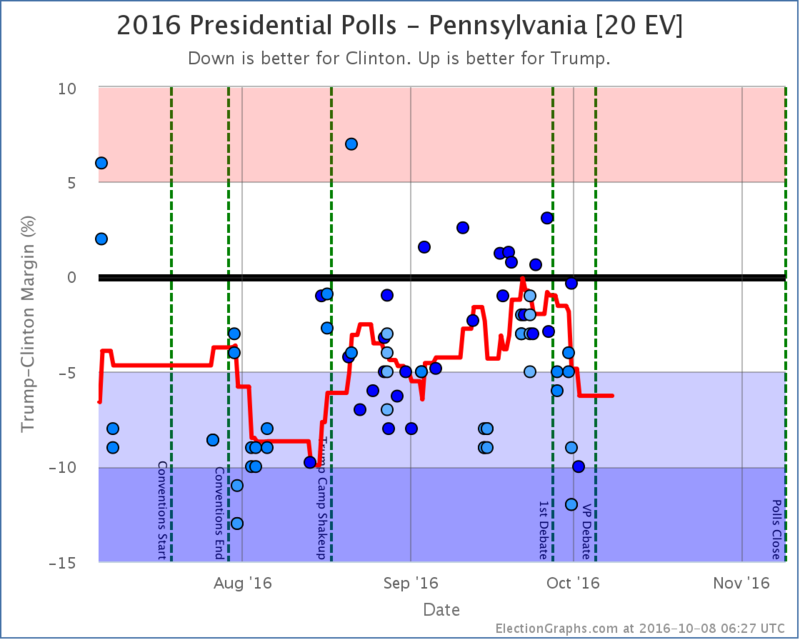 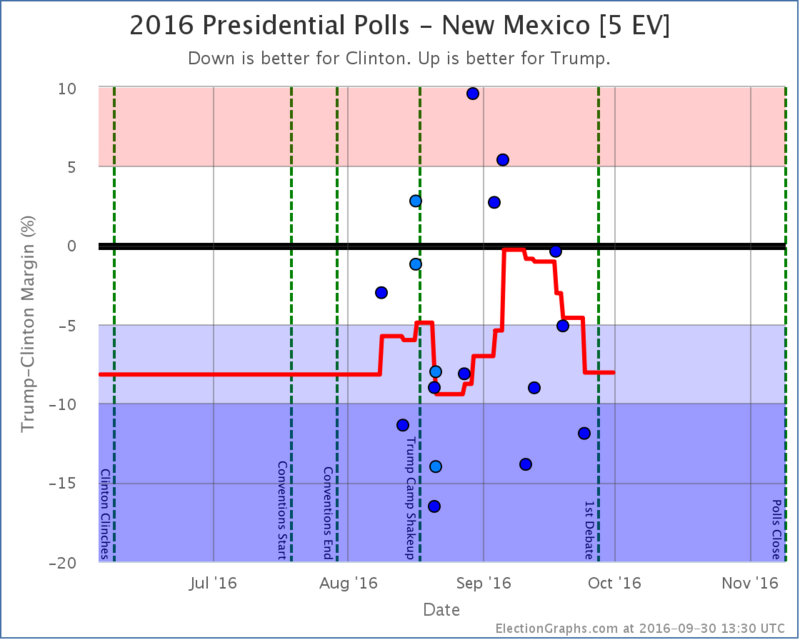 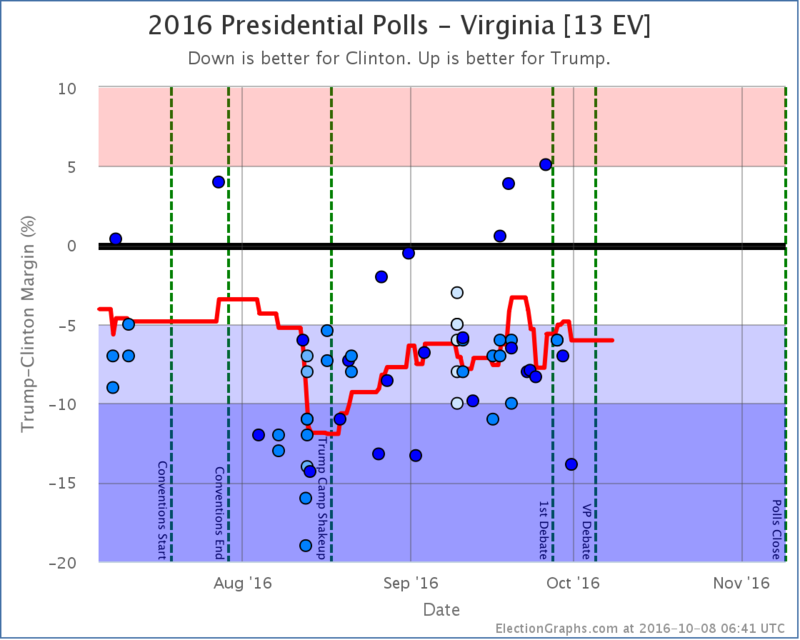 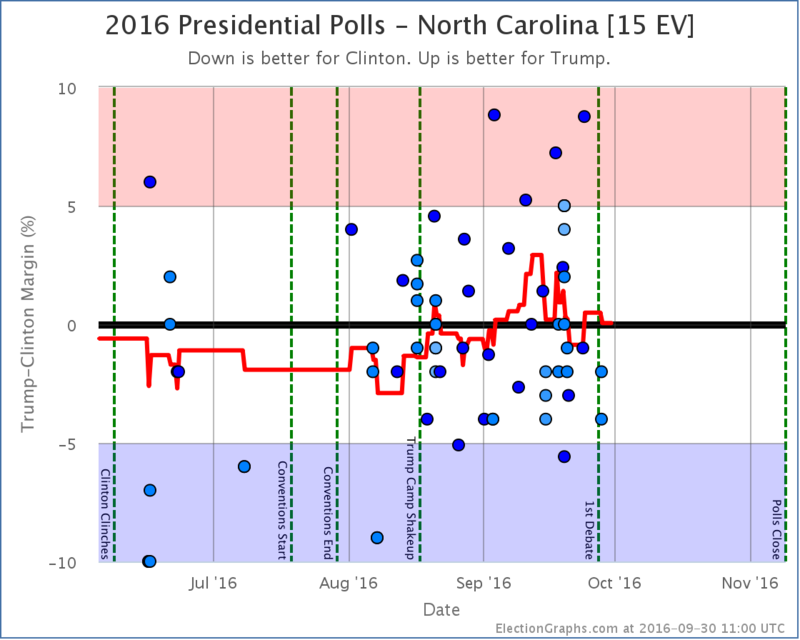 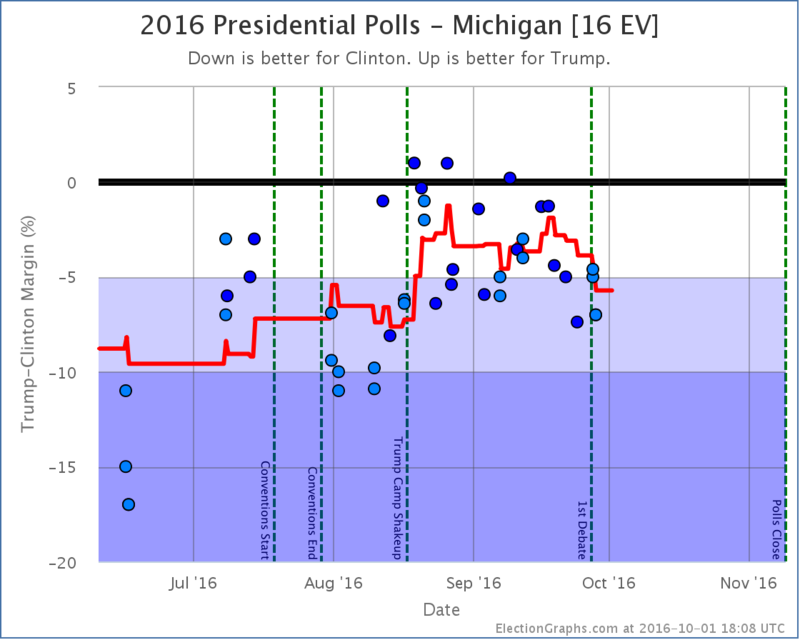 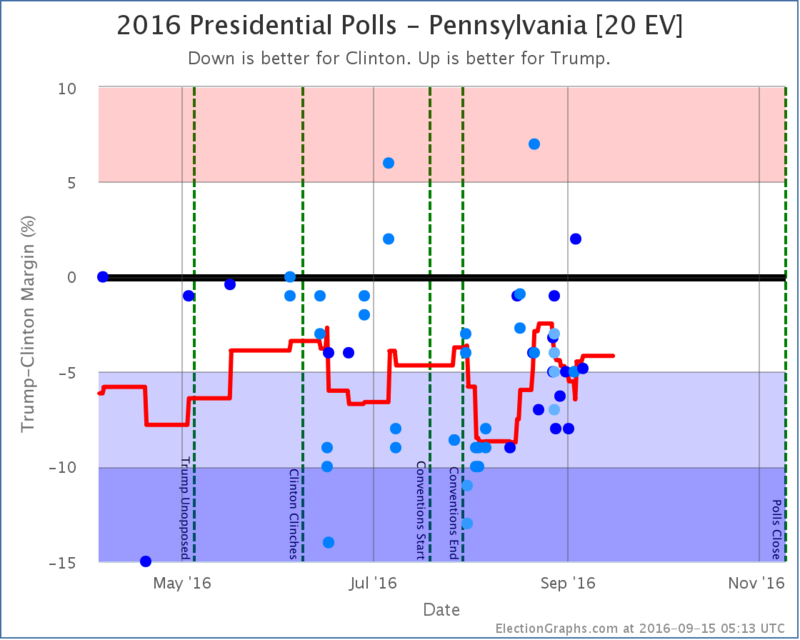 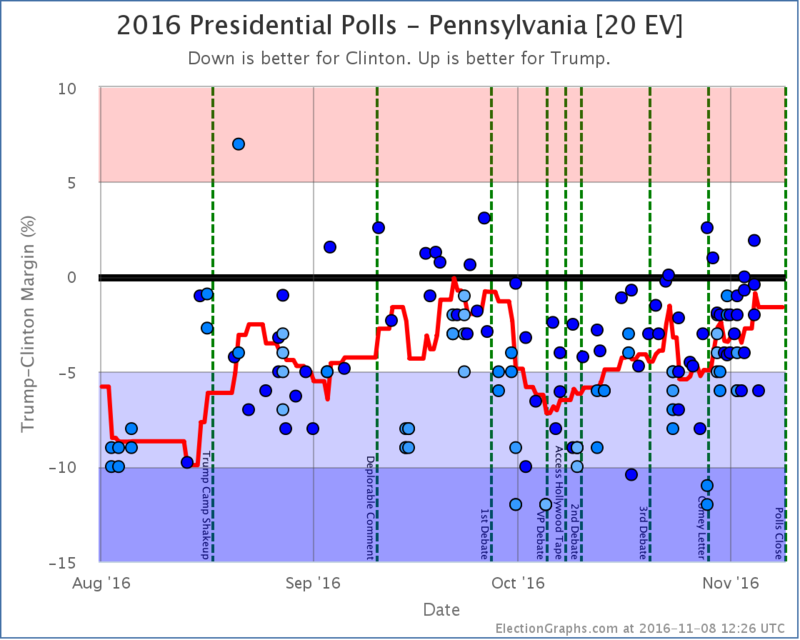 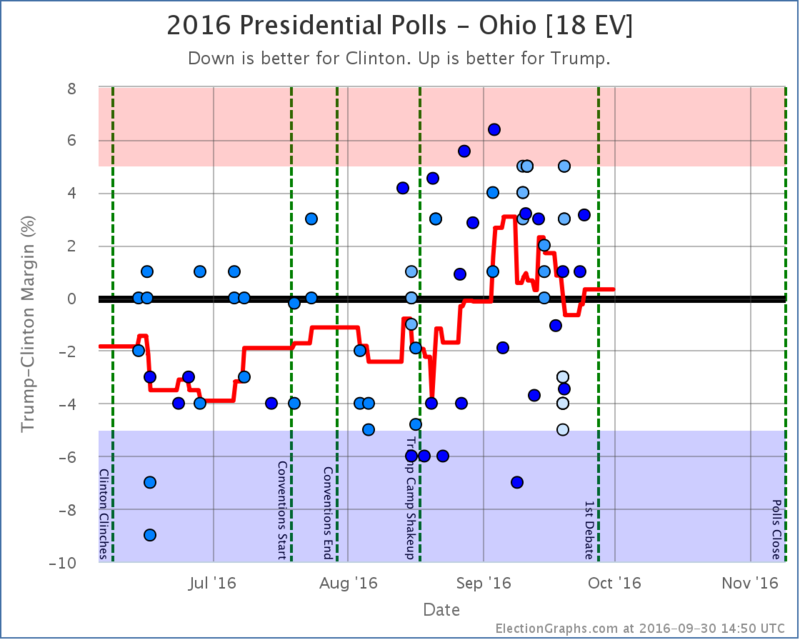 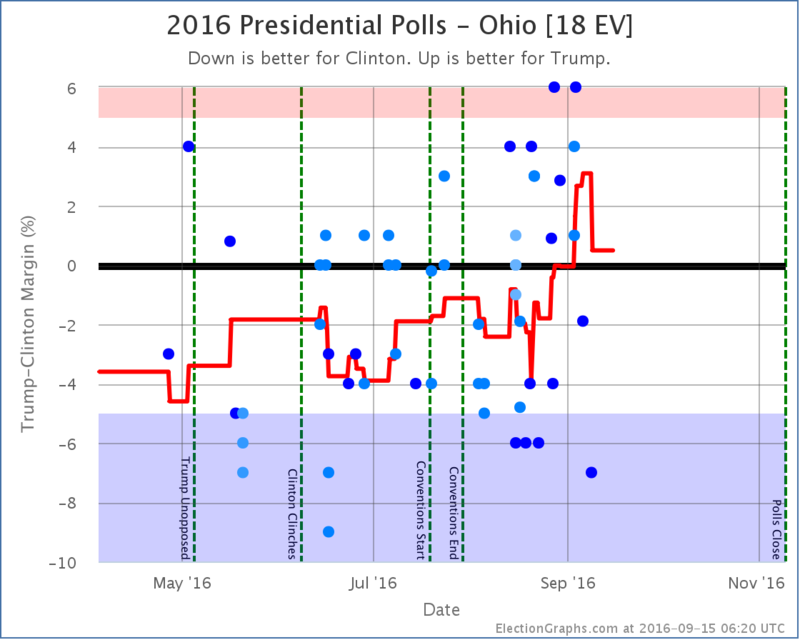 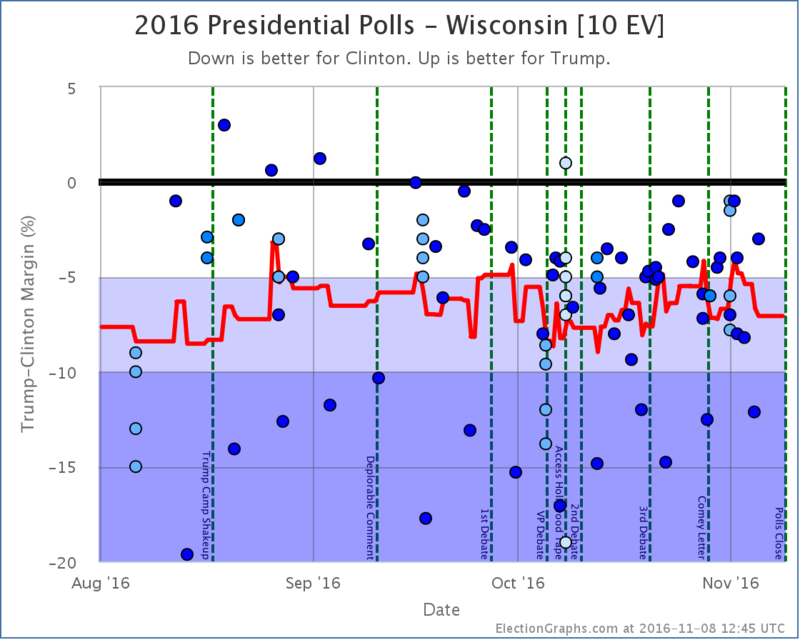 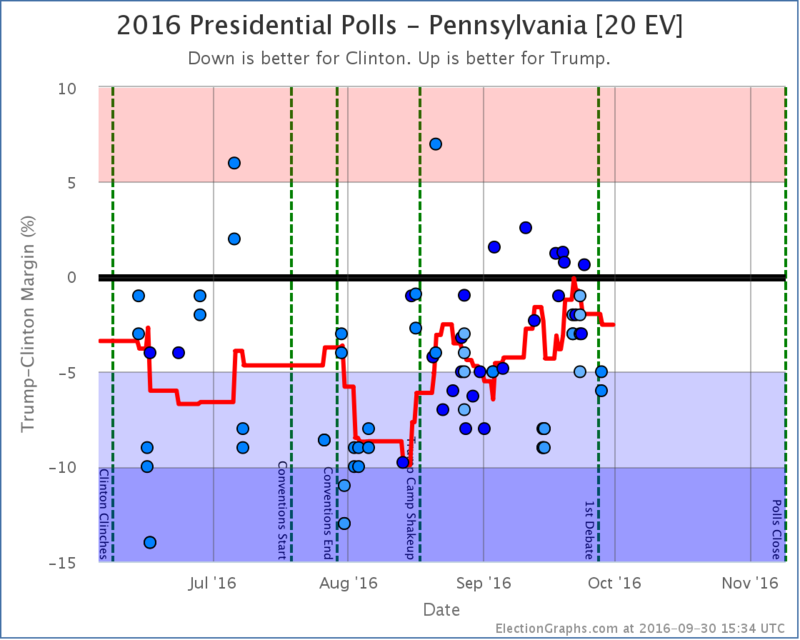 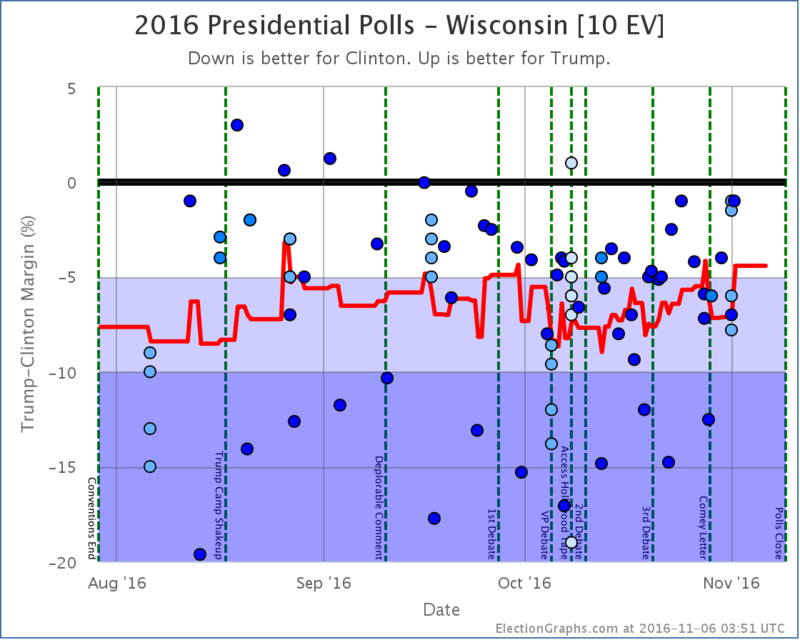 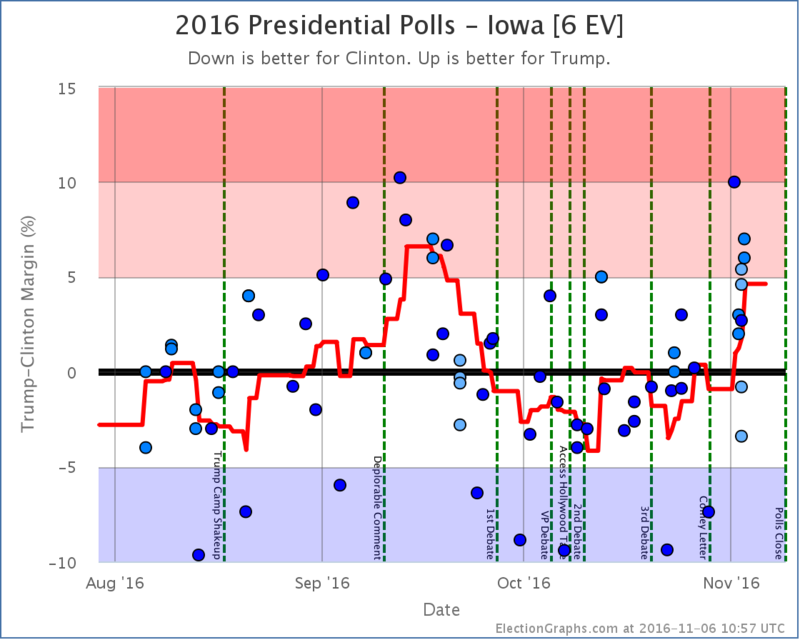 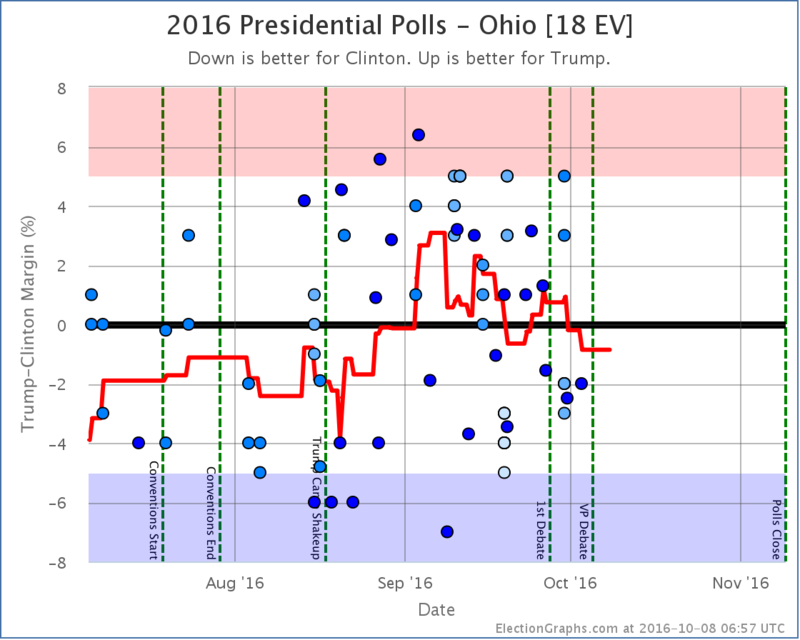 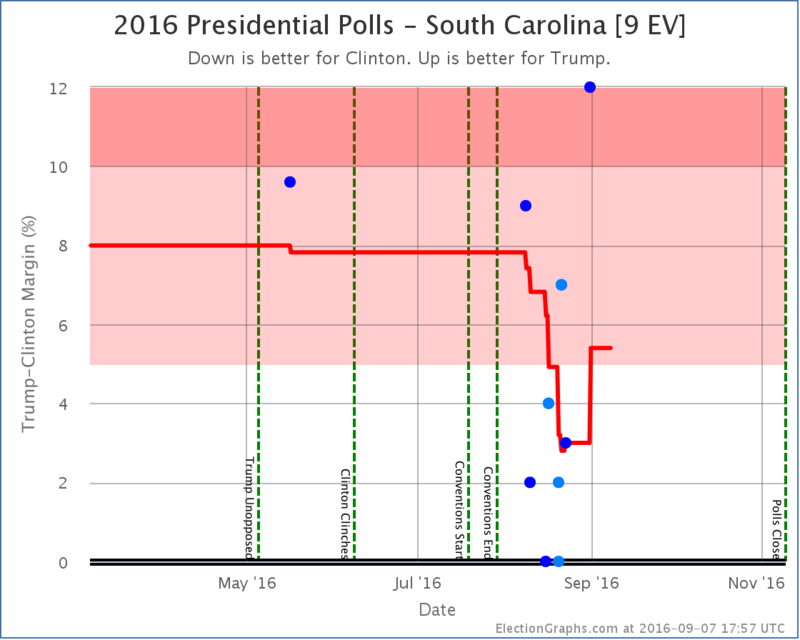 The next poll could easily move this back into “Weak Clinton”. 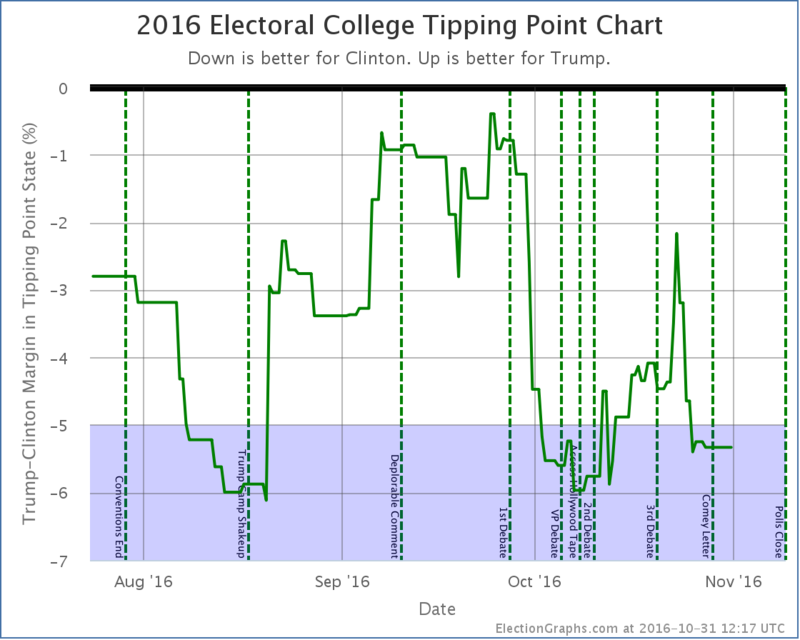 The change from today’s update to Trump’s best case is to move from winning by 56 electoral votes to winning by 66 electoral votes. 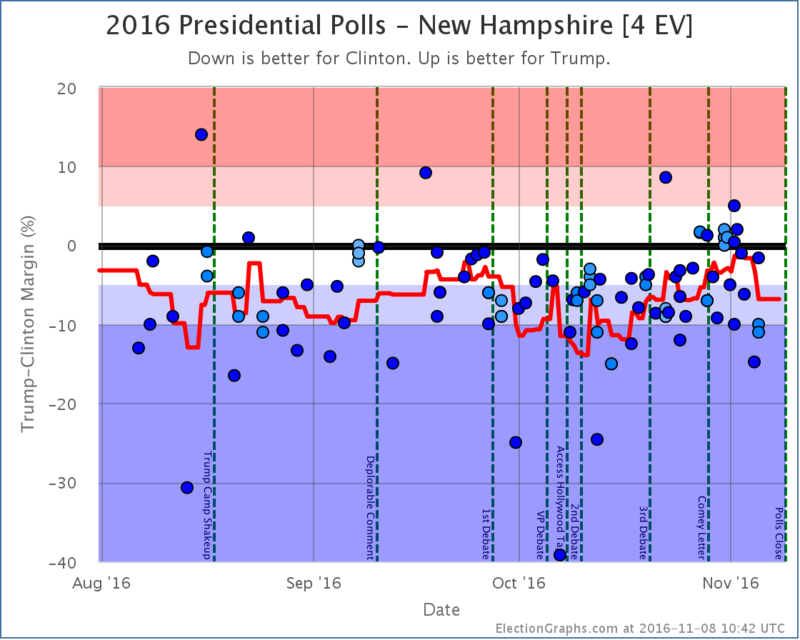 So net improvement today. 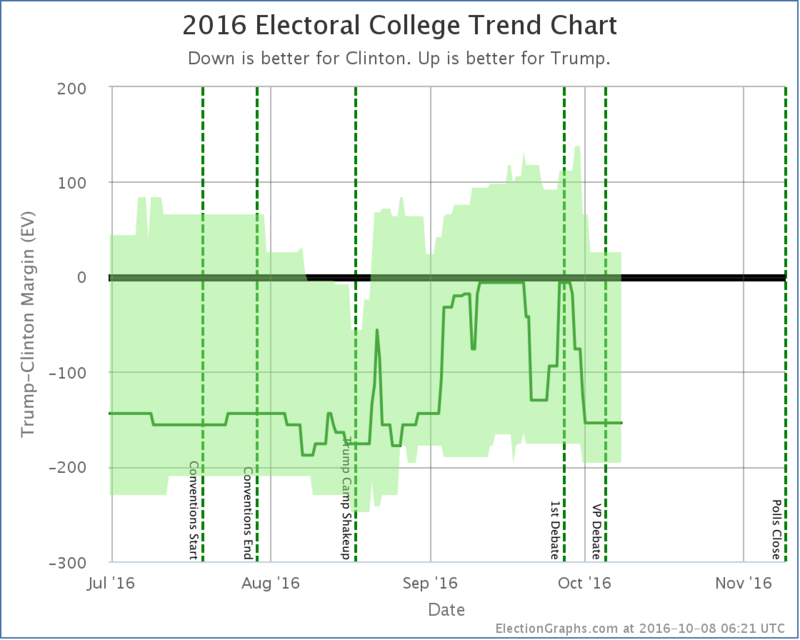 But note the downward trend after August 27th. 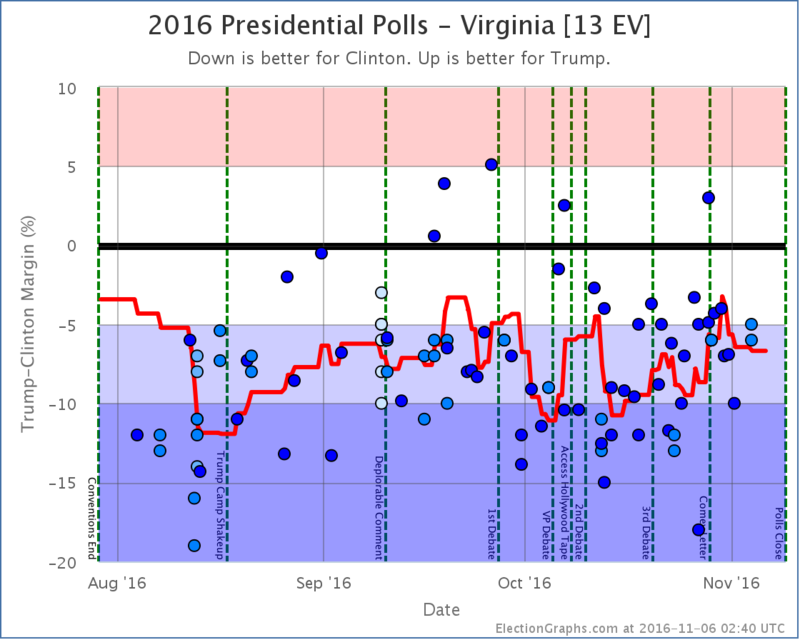 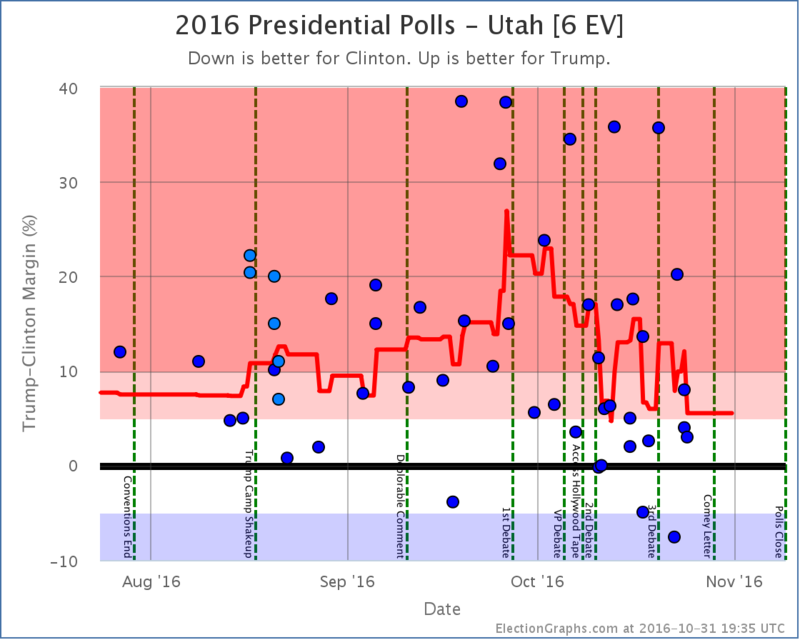 Even though today’s update was better for Trump, raising the level of the whole graph over the last week or so on the basis of some polls with older midpoints, it does look like his best case may have peaked and is receding a bit now. 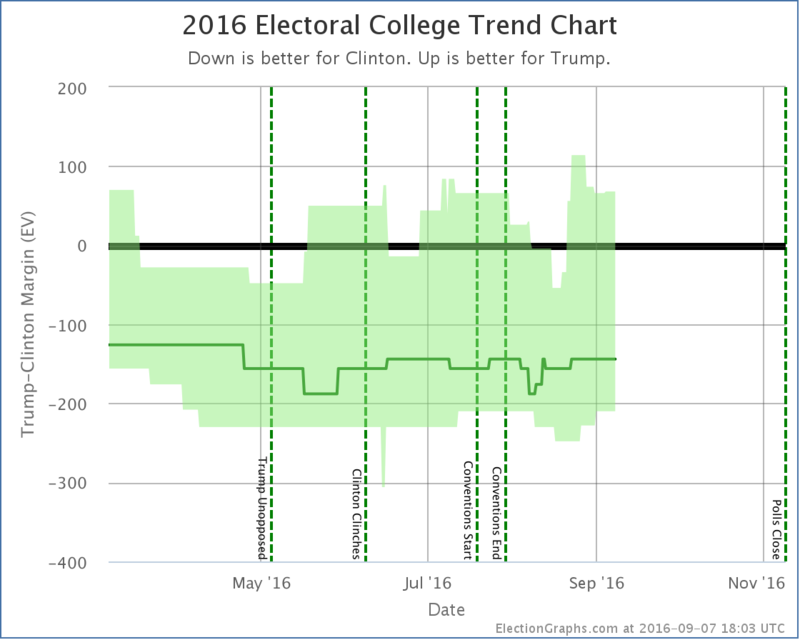 Clinton’s best case is receding as well though. 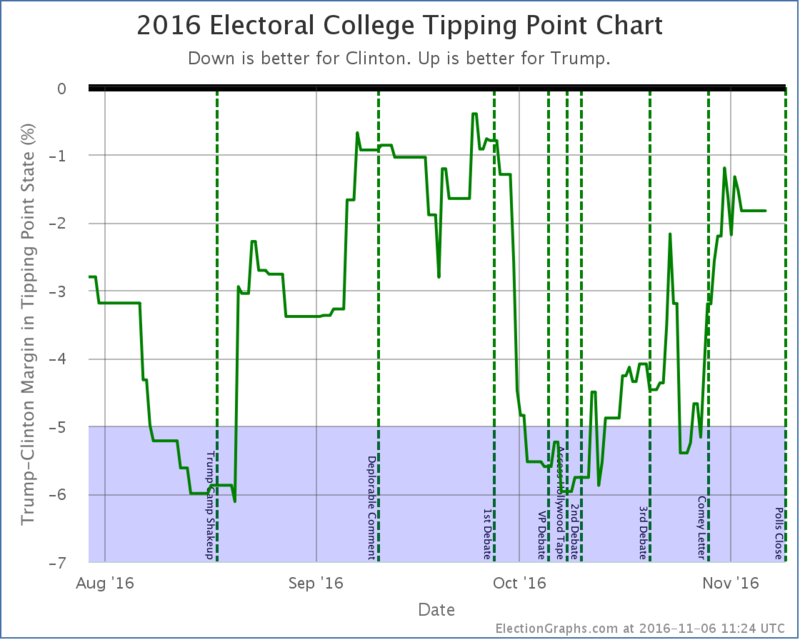 It drops in this update from winning by 248 electoral votes to only winning by 210 electoral votes. 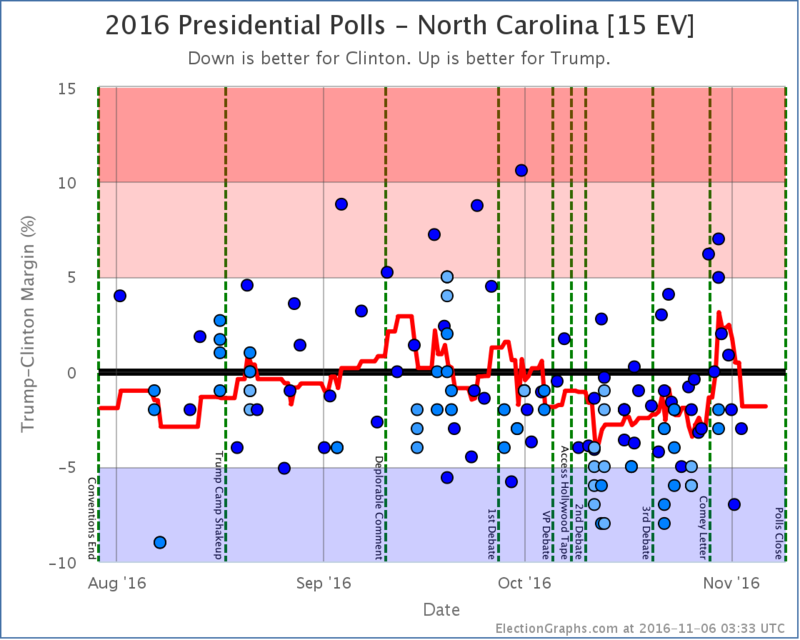 And the center line has not shifted. 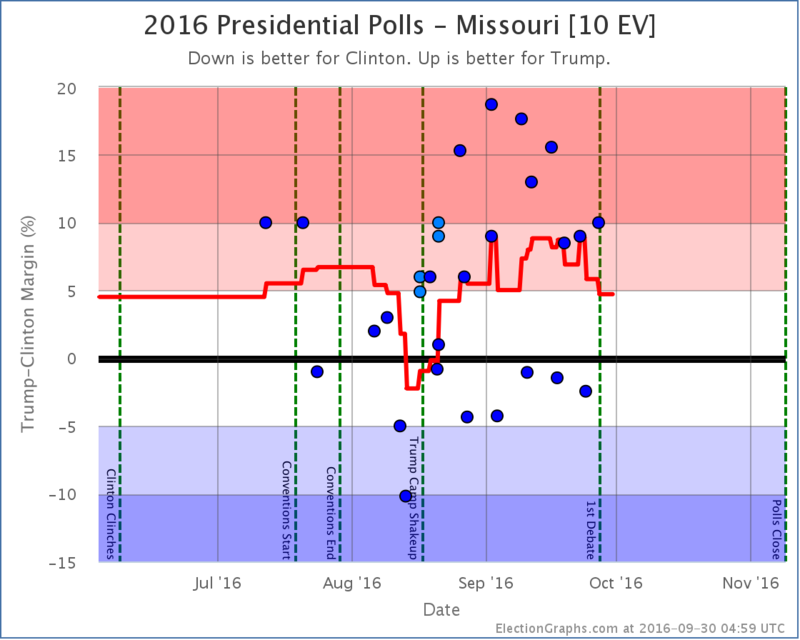 We’re talking about changes in which states are close, not in who is leading where. 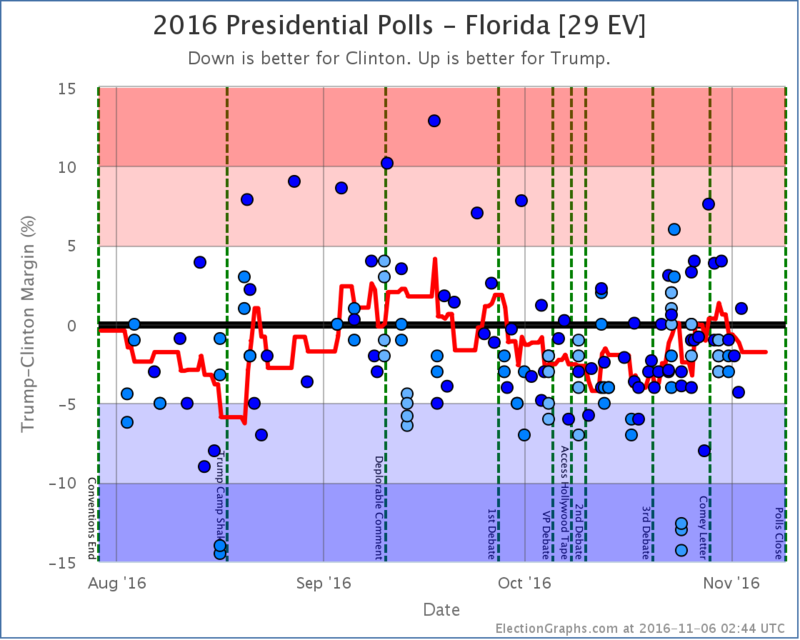 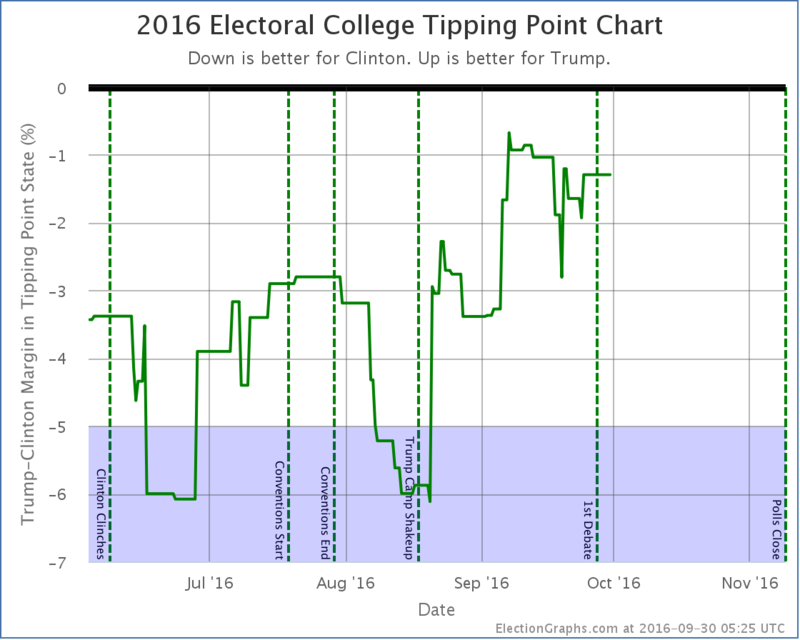 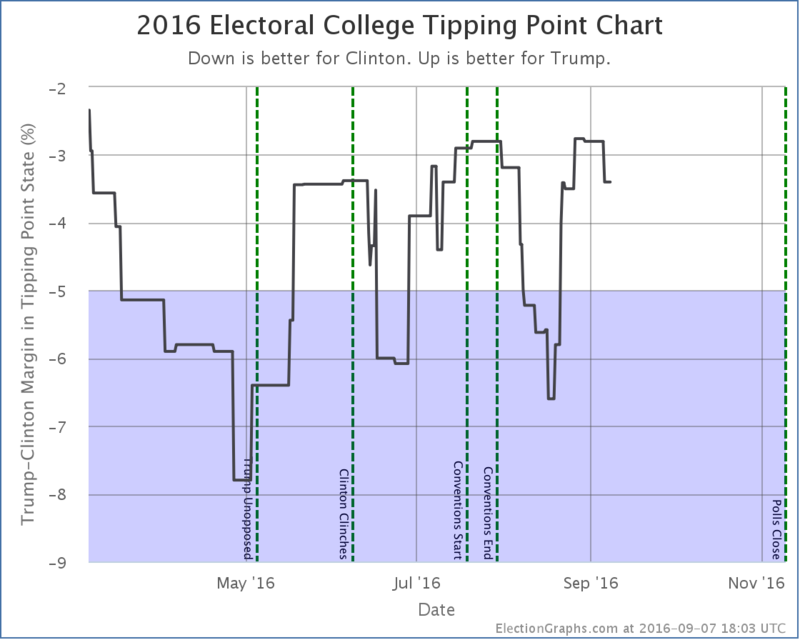 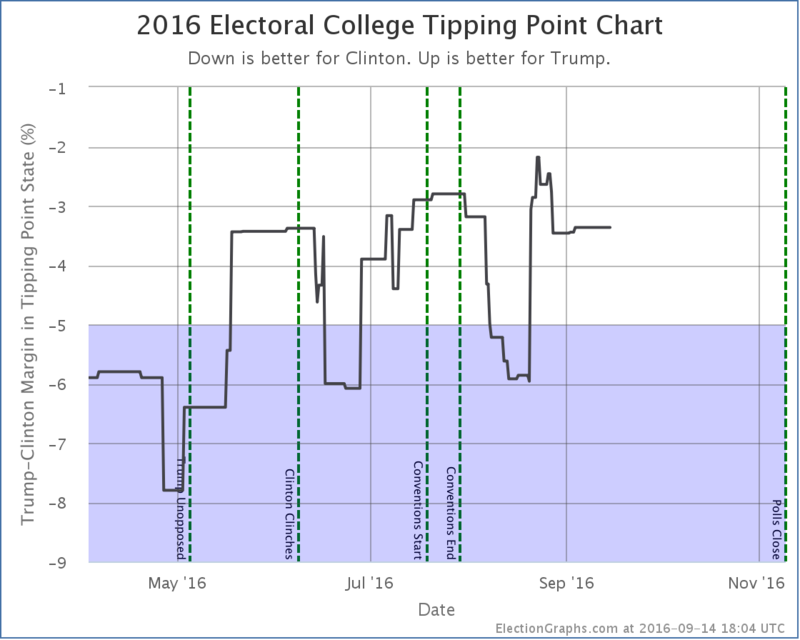 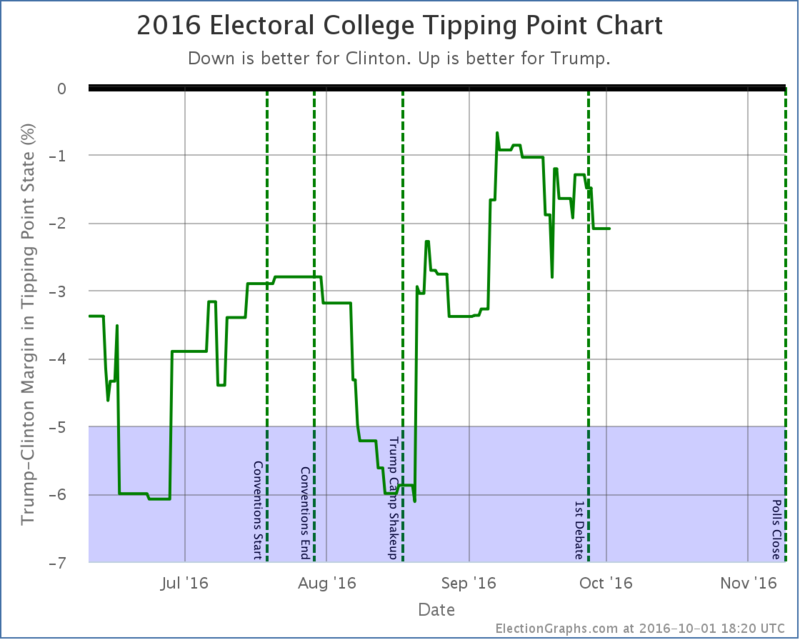 Today’s update moves the tipping point from Clinton by 3.0% in Florida to Clinton by 3.4% in Florida, but you can see that the tipping point peaked a little over a week ago and has been moving toward Clinton, similarly to how Trump’s best case has been moving. 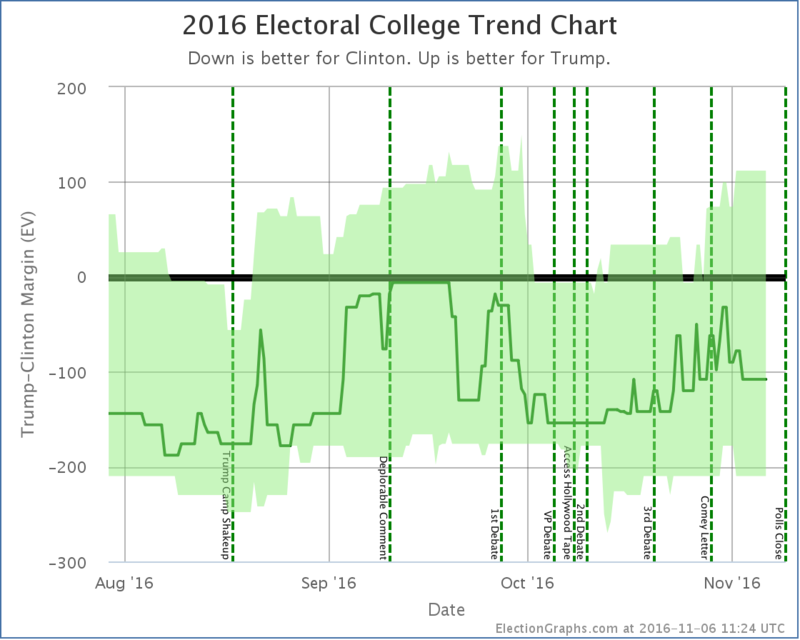 So has Trump really already passed another peak? 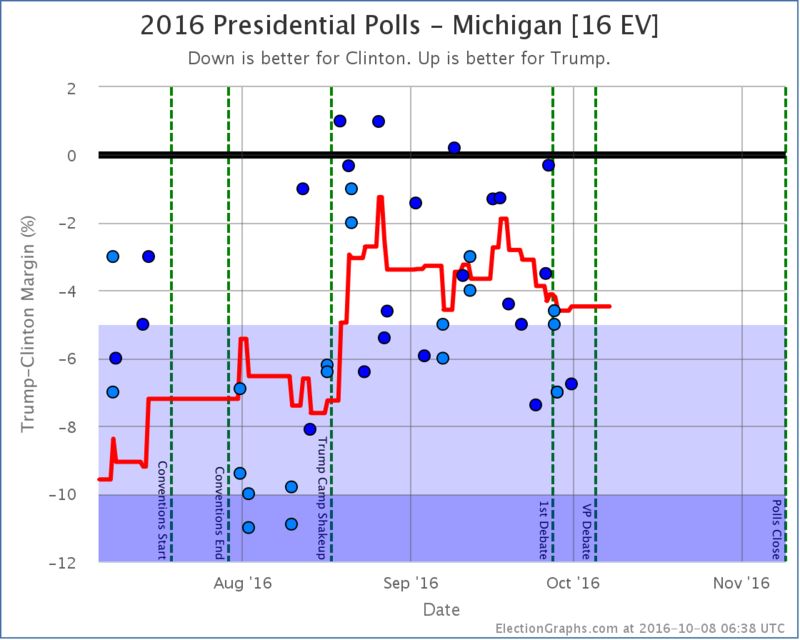 Is he on a downswing again? 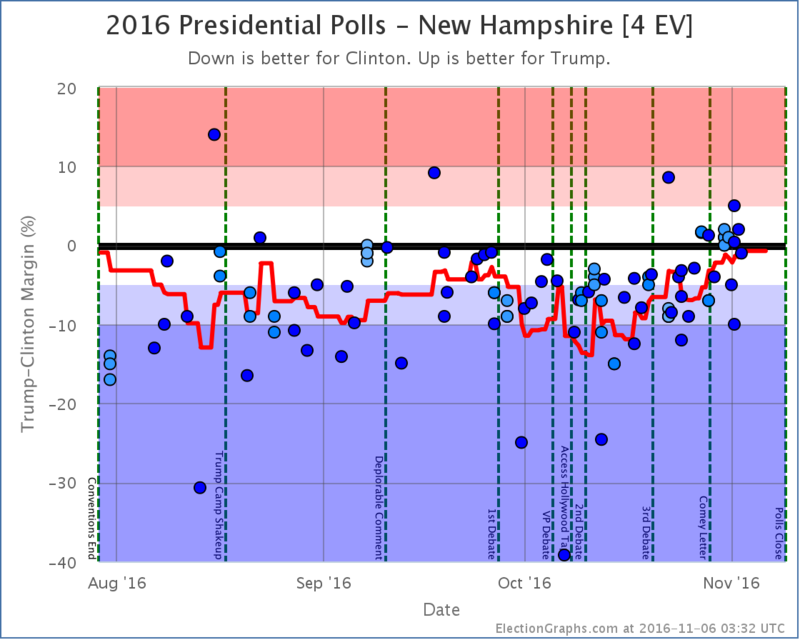 Or is this all just reversion to the mean on a race that really is pretty stable? 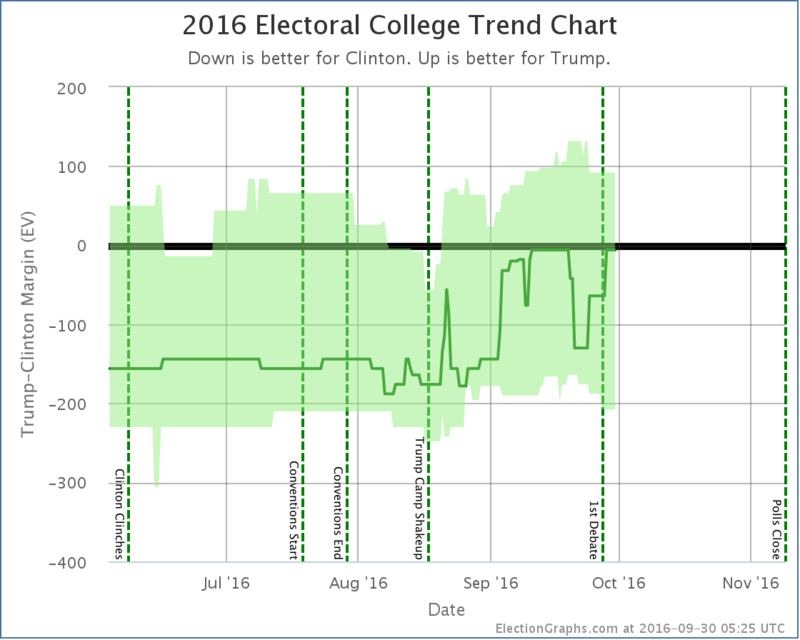 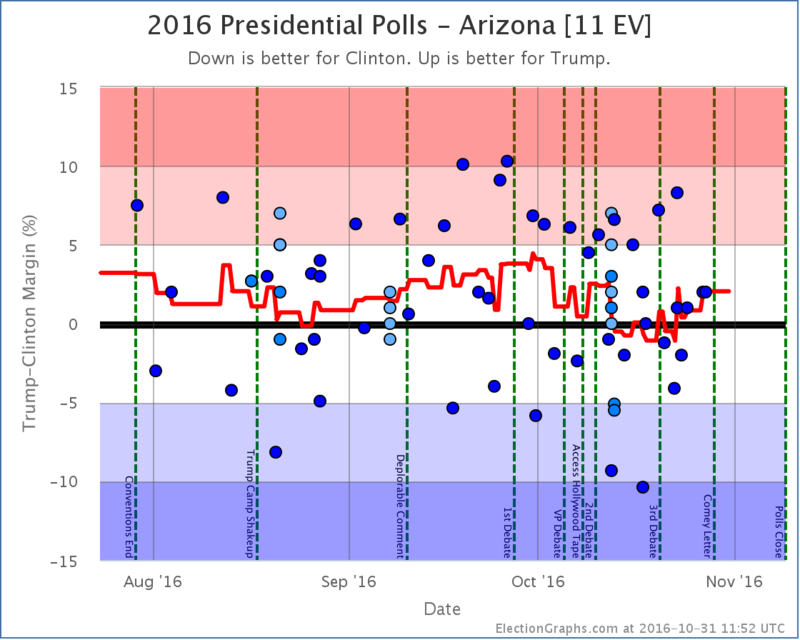 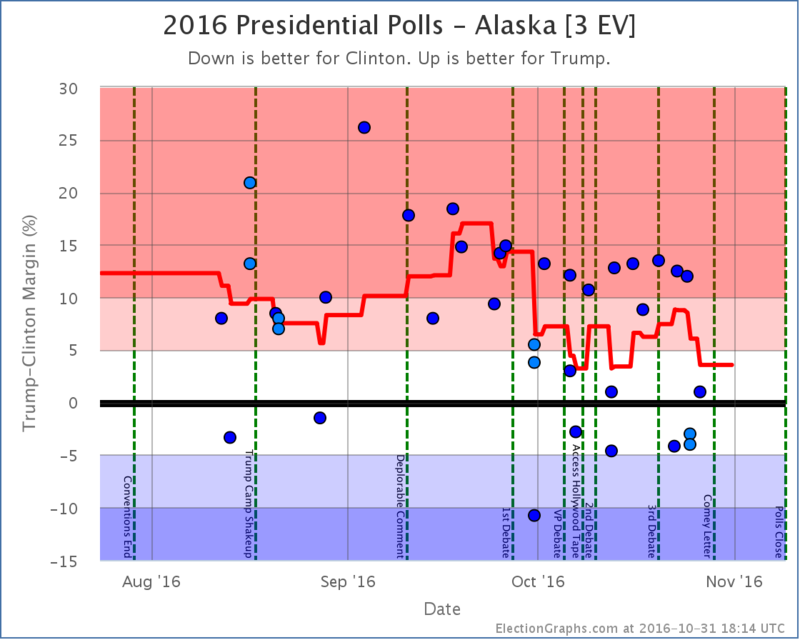 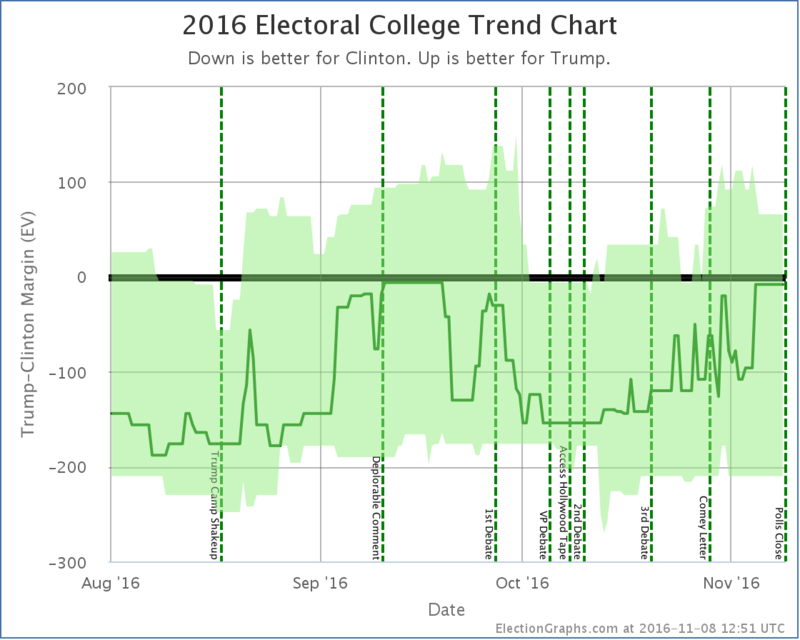 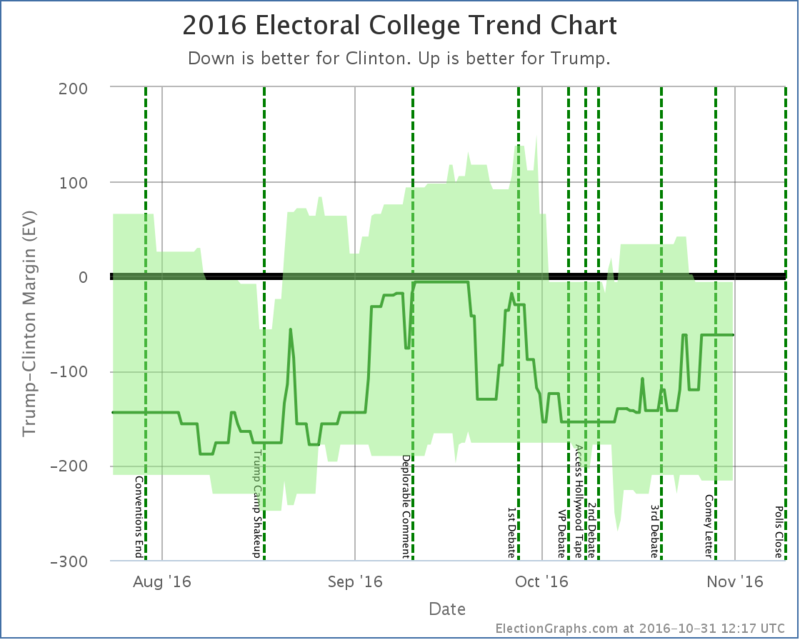 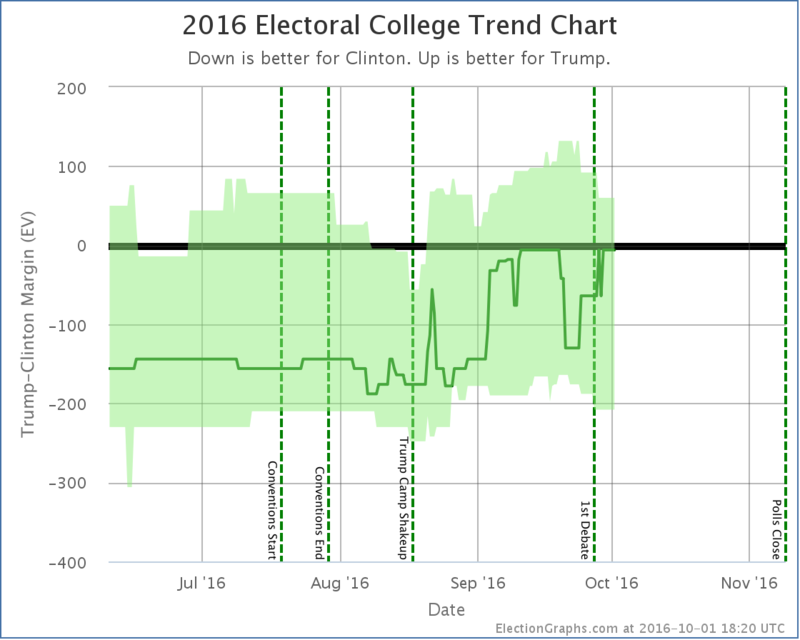 Or does Clinton weakening in the red states she had hoped to pick up mean Trump still has some momentum left? 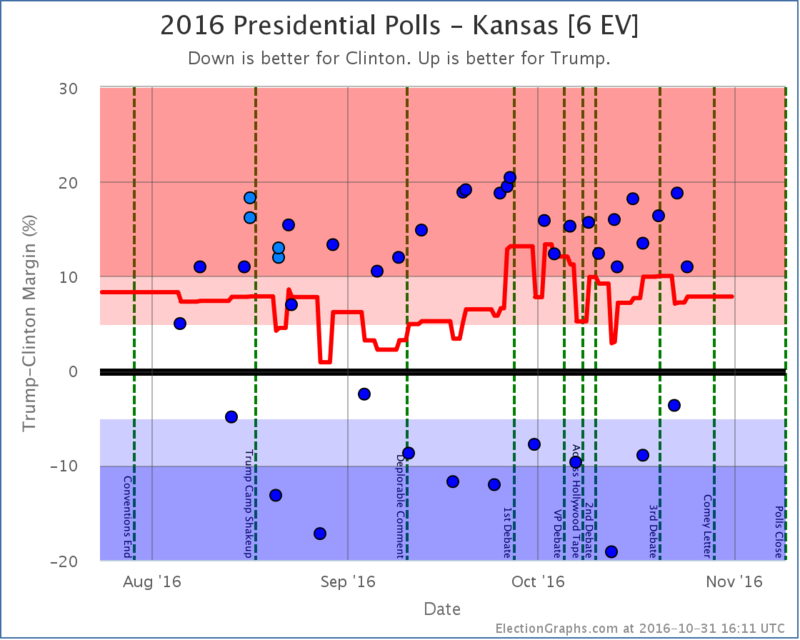 62.1 days until real election results start to come in.